This versatile layer cake is one of the lightest and fluffiest of yellow cakes. We used it for all of our Power of Flour postings’ tests, adjusting the baking powder depending on type of flour or flour combination used. The cake also serves as an excellent test for confirming your oven’s temperature. It has been featured in various forms in The Cake Bible, Rose’s Heavenly Cakes, The Baking Bible, and Rose’s Baking Basics. 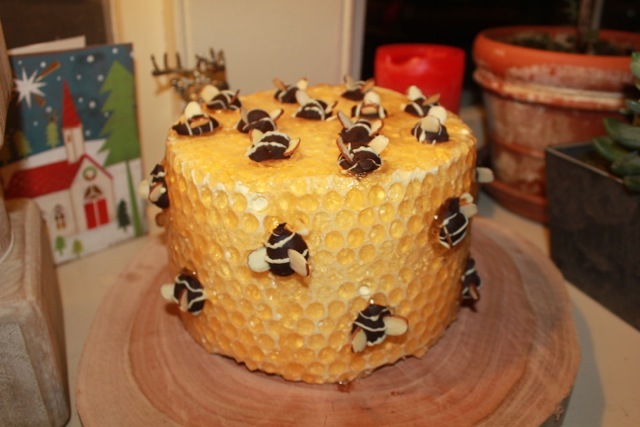 It is also the Base Formula Yellow Base Cake in The Cake Bible’s Wedding and Special Occasion Cakes chapter. * About 1 hour ahead, set the butter and eggs on the counter at room temperature (65˚ to 75˚F/19˚ to 23˚C). * In a 2 cup or larger measure with a spout, weigh or measure the egg yolks. IT TOOK 5 YOLKS instead of 4, as most large eggs today have smaller yolks. 1) Into measure with a spout, add 59 grams/1/4 cup/79 ml of the milk and vanilla and whisk just until lightly combined. 2) In the bowl of a stand mixer fitted with the flat beater, mix the flour, sugar, baking powder, and salt on low speed for 30 seconds. 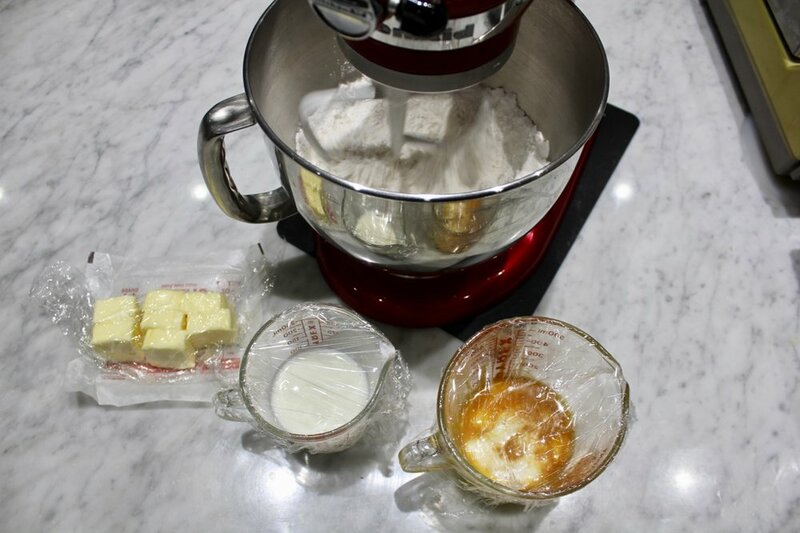 3) Add the butter and the remaining buttermilk and holding the beater with your hand, mash the butter and buttermilk into the flour mixture so that it doesn’t jump out of the mixer when beating. Then mix on low speed until the dry ingredients are moistened. Raise the speed to medium and beat for 1-1/2 minutes. Scrape down the sides of the bowl. 4) Starting on medium-low speed, gradually add the egg mixture to the batter in two parts, beating on medium speed for 30 seconds after each addition to incorporate the ingredients and strengthen the structure. Scrape down the sides of the bowl. 5) Scrape the batter into the prepared pan and smooth the surface. WEIGHING YOUR BATTER will flag you if you forgot or mis-measured an ingredient. 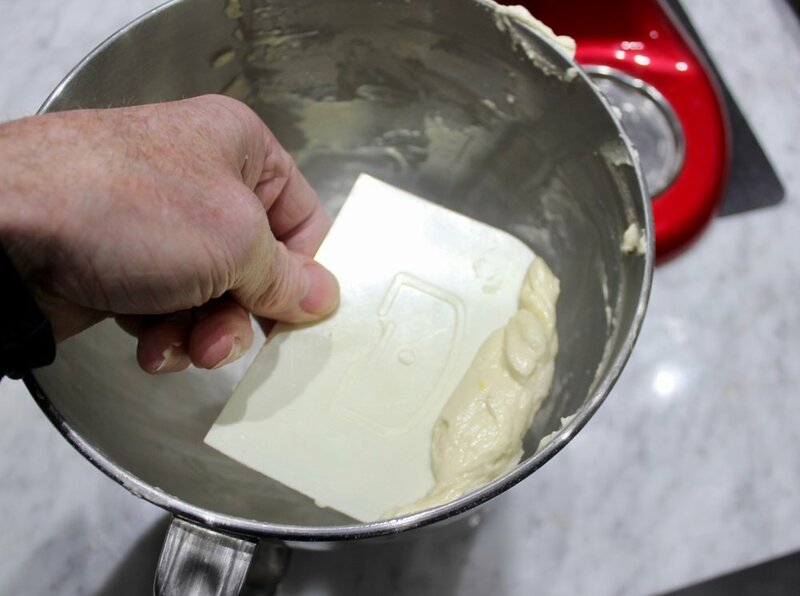 CAKE STRIPS insure uniform texture throughout the cake and minimizes over browning the sides. 6) Bake for 30 to 40 minutes (35 to 45 for a sheet cake), or until a wire cake tester inserted into the centers comes out clean. 7) Let the cake cool in the pan on wire rack for 10 minutes (15 minutes for a sheet cake). Run a metal spatula between the sides of the pan and the cake, pressing firmly against the pan, and invert the cake onto a wire rack that has been lightly coated with nonstick cooking spray. Peel off the parchment and reinvert onto the wire rack. Cool completely. Store Airtight: room temperature, 3 days; refrigerated, 1 week; frozen, 3 months. * It is essential to measure your egg yolks, as egg yolks are frequently smaller by up to 25% from the standard size. Therefore our stating up to 6 yolks on the chart. * For a two-layer simply double the recipe in half (including the leavening). * When unmolding the two layers, leave them upside down to help flatten the slightly rounded top. When composing the cake, set one layer, rounded side down on the cardboard round or plate. Frost the top and slide the second layer, rounded side up, on top. * For a 13 by 9 inch sheet cake, double all of the ingredients except to use only 4-3/4 teaspoons/21.4 grams of baking powder. What to do with those egg whites? Bake an egg white cake. Make the same recipe using. When internationally acclaimed photographer Ben Fink decided to also make videos, Rose was his first video’s subject: A Moment with Rose in 2010. His ideas for video were to make “movie trailers” for upcoming books by authors and food businesses. 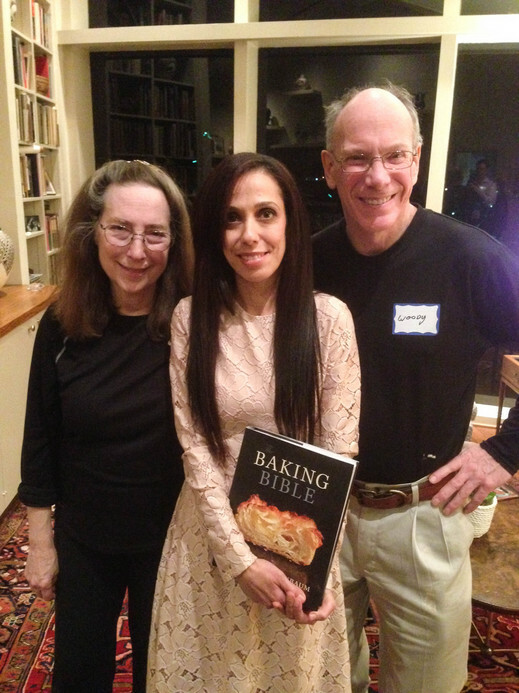 When we toured for The Baking Bible , we presented his video at several of our events. 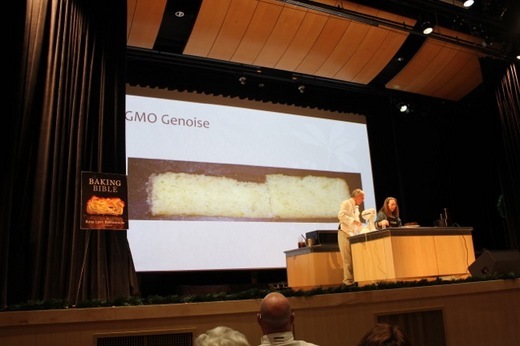 It was also presented at one of the workshops at an IACP annual conference . 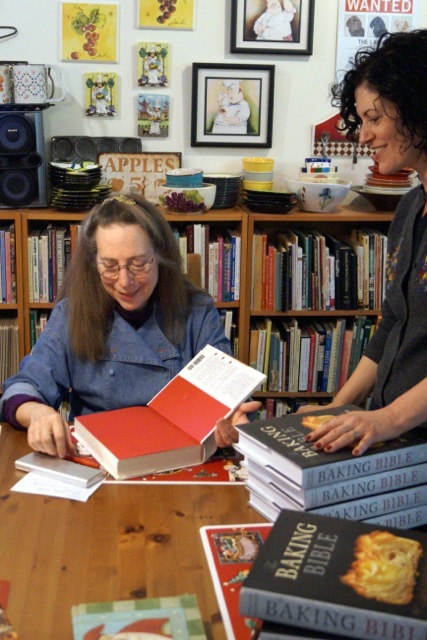 The book club members bake through a new baking book each month and learn from each other along the way. I'm thrilled to be in the company of the esteemed Thomas Keller, Dorie Greenspan, and Erin Jeanne McDowell whose books will be featured in the current three month period. 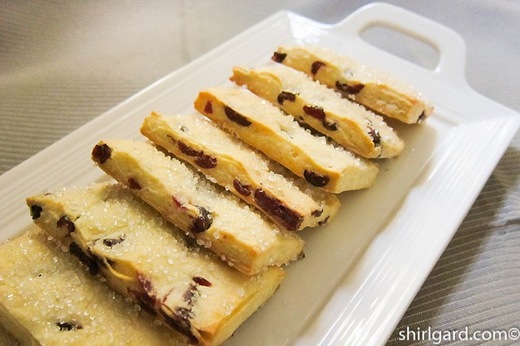 Shirl Gard, pastry chef and consultant, recently sent me her version of my Cranberry Scone Toppers from The Baking Bible. 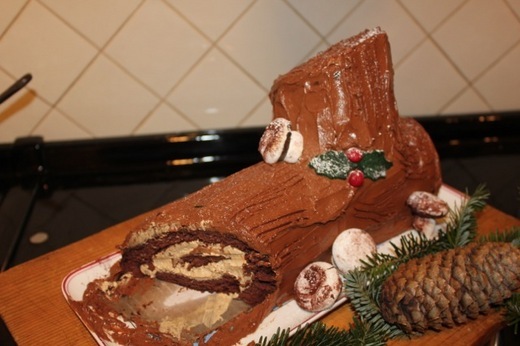 This is one of my favorite recipes and she has done an excellent presentation including step by step photos. Check out the posting on her website. 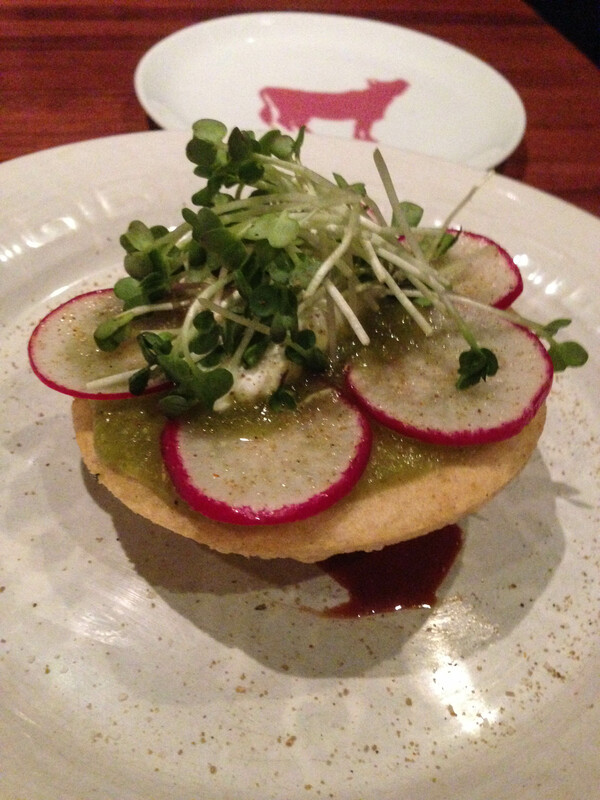 What could be more gratifying than sharing recipes and inspiring other professionals to create one's of their own! Oh wait--I know--their having the graciousness and professionalism to credit the originator of the recipe as did Shirl.! 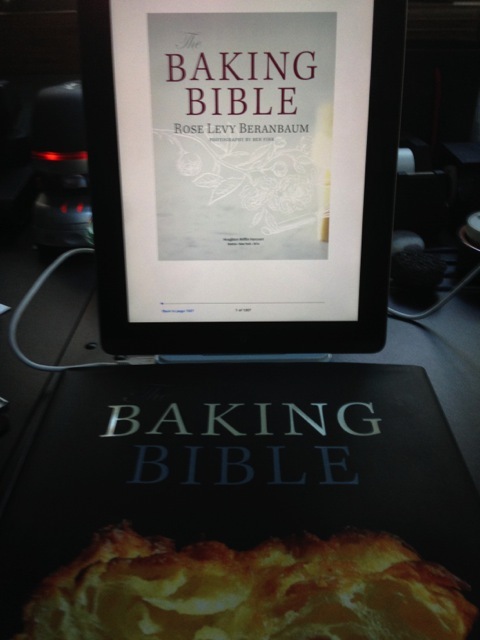 There is an extensive section on Ingredients and Equipment in the E-book version of The Baking Bible. One of the additions included is this information on sugar syrups and caramel which I'm offering here as I feel it will be useful for those who only have the hard copy. 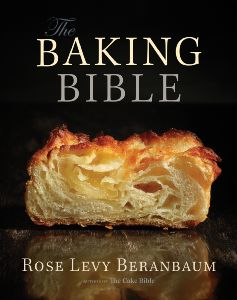 The E-book is available on Amazon: The Baking Bible Note: you don't need a Kindle to download a Kindle e-book to your Ipad. Just download the free Kindle App available un the App store on your Ipad. Sugar Syrups A small amount of simple syrup brushed onto butter cake layers does wonders to keep the cake fresh when served a day or two after baking. One table¬spoon per top and bottom of a cake layer baked in a 9 by 2-inch cake pan is just right to keep the cake moist without its becoming soggy or overly sweet. Poke the top of the cake layer all over with a thin skewer to enable the syrup to penetrate through the top crust when it is brushed on. Simple Syrup Makes: 1/2 cup/118 ml/4.7 ounces/135 grams sugar	3 tablespoons/	1.2 ounces/37 grams water	1/2 cup minus 1 tablespoon (100 ml)/3.5 ounces/100 grams pure vanilla extract	1/2 teaspoon Make the Simple Syrup In a small saucepan, stir together the sugar and water until all the sugar is moistened. Bring the mixture to a rolling boil over medium-high heat, stirring constantly. Remove From the heat and cool completely. Transfer it to a heatproof glass measure and stir in the vanilla. Add water to equal 1/2 cup/118 ml of syrup. Cover and refrigerate for up to 1 month. Concentrated Sugar Syrups When making a sugar syrup for Italian meringue, for example, the sugar is concentrated to produce a supersaturated solution from a saturated one. A saturated sugar solution contains the maximum amount of sugar possible at room temperature without its precipitating out into crystals. A supersaturated sugar solution contains more sugar than the water can dissolve at room temperature. Heating the solution enables the sugar to dissolve. Cold water is capable of holding double its weight in sugar, but by heating it, more sugar can dissolve in the same amount of water. A sugar solution begins with sugar, partially dissolved in at least one-third its weight of cold water. It is stirred continu¬ously until boiling, at which time all the sugar is dissolved. If sugar crystals remain on the sides of the pan, wash down the sides with a wet pastry brush. The solution is now considered supersaturated and, to avoid crystallization, must not be stirred. As the water evaporates, the temperature of the solution rises and the density increases. Concentration of the syrup depends on the amount of water left after evaporation. The temperature of the syrup indicates the concentration. As long as there is a lot of water in the syrup, the temperature does not rise much above the boiling point of the water. But when most of the water has boiled away, the temperature can now rise dramatically, passing through various stages and eventually rising to the temperature of melted sugar (320°F/160°C) when all the water is gone. Concentration can also be measured by density using a saccharometer or Baumé weight scale. A Baumé scale is graduated from 0° to 44° and corresponds in a direct relationship to the degrees Fahrenheit or Celsius. The degree of evaporation can also be measured by consistency, by dropping a small amount of the syrup into ice water. Supersaturated solutions are highly unstable and recrystallization can occur from agitation or even just by standing unless the solution was properly heated in the first place. The use of an "interfering agent" (so called because it interferes with crystal-lization), such as invert sugar (a little more than one-fourth the weight of the granulated sugar), butter, cream of tartar, or citric acid helps keep the solution stable by interfering with the crystalline structure formation. This is especially useful when the solution will be used in a way that will involve repeatedly dipping into it, such as for making spun sugar, or for storing it so that it doesn't crystallize. 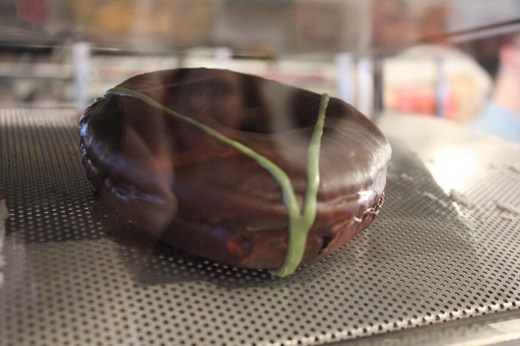 As melted sugar reaches higher temperatures, many chemical changes begin to occur. The sugar cannot start to caramelize until all the water is evaporated. As it starts to caramelize, its sweetening power decreases. At this point, when all the water has evapo-rated, stirring will not cause the sugar to crystallize. The addition of a significant amount of an ingredient such as nuts, however, can lower the temperature considerably, and this will cause crystallization to occur instantly if no interfering agent was used. When sugar syrup has been prepared in advance, it is sometimes necessary to check the exact quantity of sugar and water it contains. It is important to know that the Baumé reading in a cold solution measures slightly higher than does the same solution when hot. Another variant that affects density reading is altitude. Because water boils at a lower temperature as altitude increases (there is less air pressure weighing on the water to prevent it from changing from liquid into vapor), there will be a different temperature for the same concentration of sugar syrup at different altitudes. For each increase of five hundred feet in elevation, syrup should be cooked to a temperature 1°F lower than the temperature called for at sea level. If readings are taken in Celsius, for each nine hundred feet of elevation, cook the syrup to a temperature 1°C lower than what is called for at sea level. These adjustments should be made up to 320°F/160°C, the melting point of sugar at all altitudes. Note that partially refined sugar caramelizes at a lower temperature than fully refined sugar. If you are not using a thermometer for caramel, use a clean clear or light-colored silicone spatula to determine the color. (Any sugar remaining on the spatula will cause crystallization.) Take care that the caramel does not become too dark as it will be bitter. Temperatures and Tests for Sugar Syrup 215°F. Thread: The sugar may be pulled into brittle threads between the fingers. This is used for candy, fruit liqueur making, and some icings. 220 to 222°F. Pearl: The thread formed by pulling the liquid sugar may be stretched. When a cool metal spoon is dipped into the syrup and then raised, the syrup runs off in drops, which merge to form a sheet. This is used for making jelly. 234 to 240°F. Soft ball: Syrup dropped into ice water may be formed into a ball which flattens on removal from the water. This is used for extra light Italian meringue, fondant, fudge, peppermint creams, and classic buttercream. 244 to 250°F. Firm ball: Syrup dropped into ice water may be formed into a firm ball, which does not flatten on removal from the water. This is used for light Italian meringue, caramels, nougats, and soft toffees. 250 to 266°F. Hard ball: Syrup dropped into ice water may be formed into a hard ball, which holds its shape on removal but is still plastic. This is used for toffee, divinity, marshmallows, and popcorn balls. 270 to 290°F. Soft crack: Syrup dropped into ice water separates into thread, which are hard but not brittle. 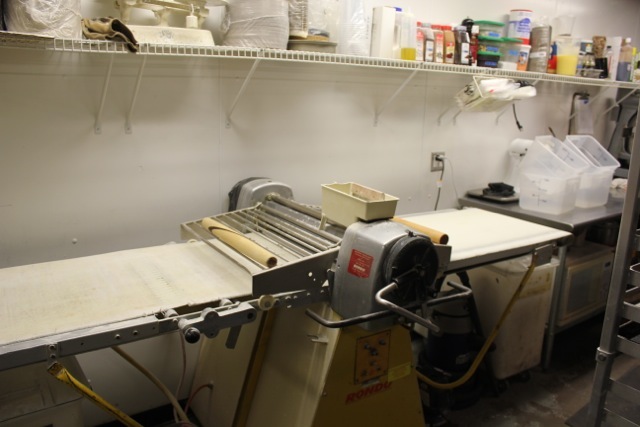 This is used for Italian meringue for piping elaborate designs, butterscotch and taffy. 300 to 310°F. Hard crack: Syrup dropped into ice water separates into hard, brittle threads. This is used for brittle and for glacéed fruits. 320°F. Clear liquid: The sugar liquefies (all moisture is removed) and can start browning. This is used for making barley sugar (a candy). 338°F. Brown liquid: The liquefied sugar turns brown. This is used for light caramel. 356°F. Medium brown liquid: The liquefied sugar darkens. This is used for praline, spun sugar, caramel cages, and nougatine. 374°F. Dark brown liquid: The liquefied sugar darkens further. This is used for intensely flavored caramel cream sauce and as a coloring agent for sauces. 410°F. Black Jack: The liquefied sugar turns black and then decomposes. Caramel Different temperatures, ranging from 350°F. to 380°F. are suitable for different types of caramel. When making spun sugar, for example, too light a color would produce a ghostly effect and too dark a color would produce a brassy color when spun. When making a caramel sauce, however, 380°F. will offer a deeper more intense flavor. Over 380°F. and the caramel becomes unpleasantly bitter. Recommended Temperatures for Caramel: Pale amber 350°F to 360°F for a caramel cage. Deep amber 360°F. to 370°F. for spun sugar. Dark amber 370°F. to 380°F. for praline powder, caramels or caramel sauce. If using partially refined sugar, 360°F. Caramel is extremely difficult to make in humid weather because sugar is highly hygroscopic ("attracts water"). The moisture in the air will make the caramel sticky. A 1/2 cup of sugar makes 1/4 cup of liquid caramel (plus the residue that clings to the pot). If hardened and then pulverized, it returns to its original volume of 1/2 cup. Caramel Sauce After the caramel is prepared, do not stir it too much, because this may eventually cause crystallization, especially on storage. However, glucose or corn syrup is usually added as it helps to prevent the caramel from crystallizing when stirred. It also lowers the caramelization temperature. 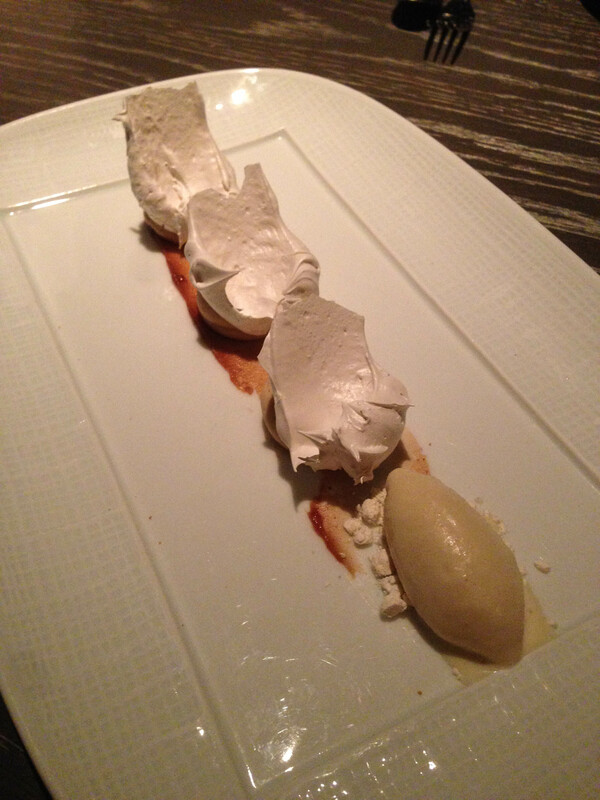 I adore the flavor of caramel, so I like to have as much depth of flavor as possible without any burned flavor. 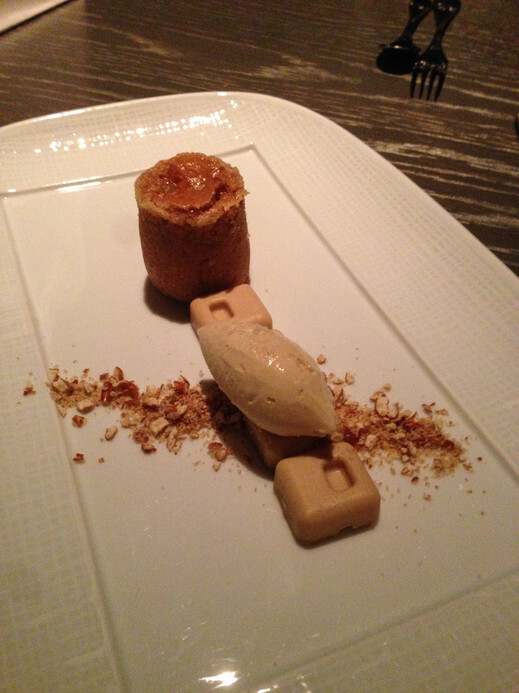 I like to bring this caramel up to 360°F/180°C for maximum flavor and for some applications as high as 380/193°C. Also, the darker you make the caramel, the less sweet it will seem, but you risk burning it if you don't have an absolutely accurate thermometer. A viable alternative is to use a light-colored or transparent silicone spatula so that you can see the color of the caramel as it darkens. It's best to have the cream hot and the butter at room temperature to avoid splattering when they are added to the hot caramel. Cold cream, however, speeds the cooling and is practical if you are pressured for time, but it must be added very slowly. Heating Sugar Syrups and Caramel When the mixture approaches the desired finished temperature, be sure that the burner heat is no higher than medium-low. This helps to prevent the temperature of the syrup from rising after it is removed from the heat. Our six weeks of touring concluded just about where we started--New York City. 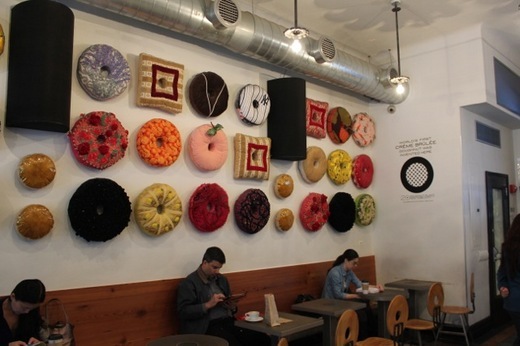 We left extra early to be sure to arrive at the Martha Stewart New York studios well ahead of time given the variables of traffic on route 80 and arrived so early we headed straight to the reasonably close by Doughnut Plant for doughnuts and coffee. They claim to be creator of the world's first crème brûlée doughnut, which quickly became the Doughnut Plant's signature, and also square jellied filled doughnuts. They now even have shops in Japan. The engaging manager enjoyed telling us about the doughnuts and, as a self-proclaimed dessert lover, looking through our new "Baking Bible." 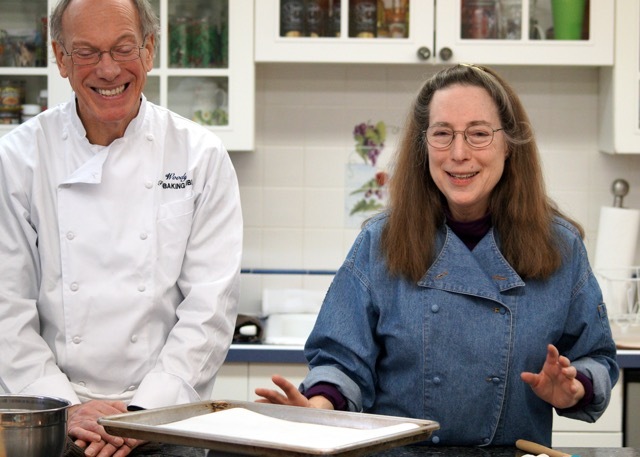 My dear friend Martha had recently made one of my cupcake recipes on her television show, so I was looking forward to an unstructured live radio conversation with her on her Sirius Radio Show. 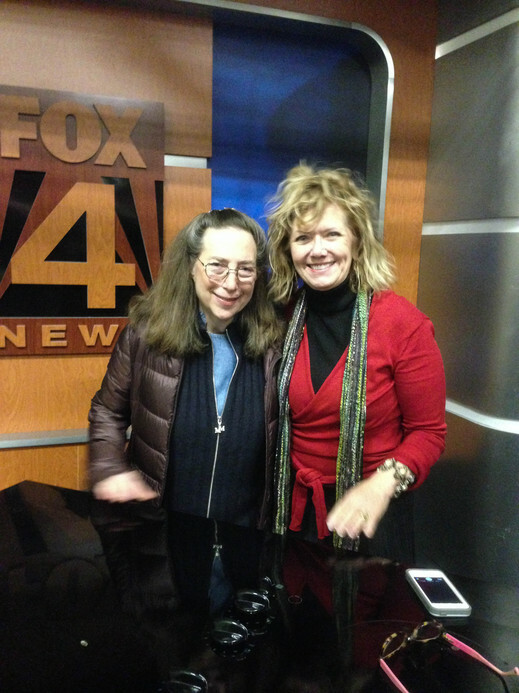 I had been on several times in the past with her radio host Lucinda Scala Quinn. 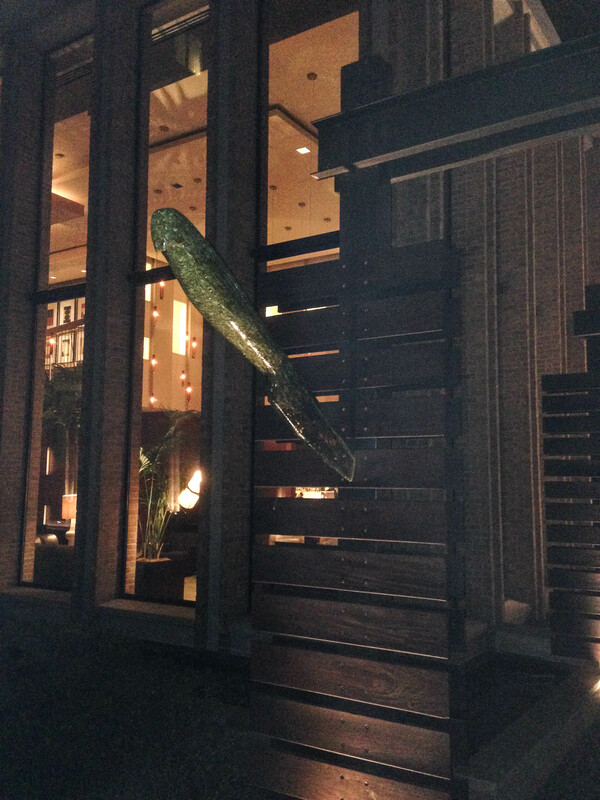 But when we arrived at the studio we were informed that Martha had the flue. 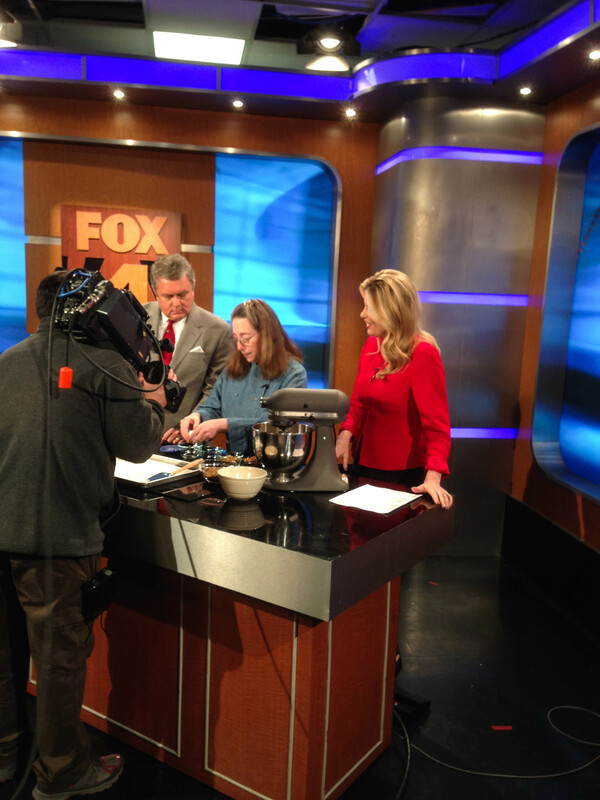 We also learned that I was to share the air time with another cookbook author, Carol Barrow. We were both delighted to make her acquaintance. Her wonderful book, "Mrs. Wheelbarrow's Practical Pantry: Recipes and Techniques for Year-Round Preserving" on canning and preserving was released just after ours. She brought along several of her homemade preserves for all of us to enjoy. 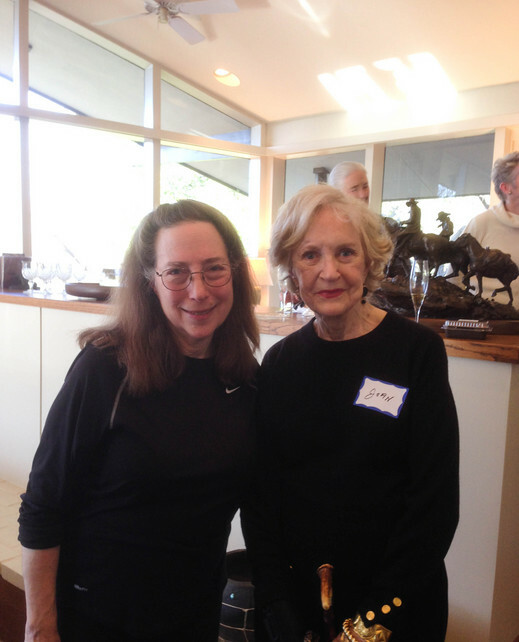 Lucinda, who had moderated my 92nd Y event just a few weeks ago, and had read my book cover to cover, stepped in for Martha. 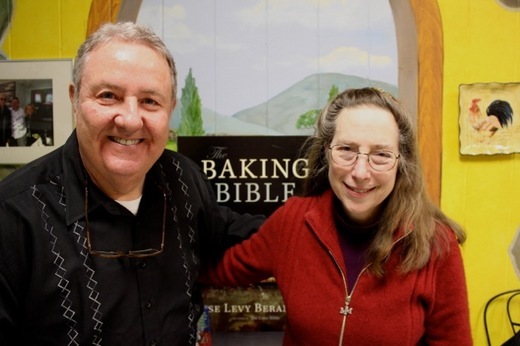 We briefly talked about "The Baking Bible" and then went on to discuss my thoughts and tips for solving common baking problems, after which Lucinda opened up the phone lines for me to answer caller's questions from Delaware to California. The time went all too quickly with the lively array of questions. 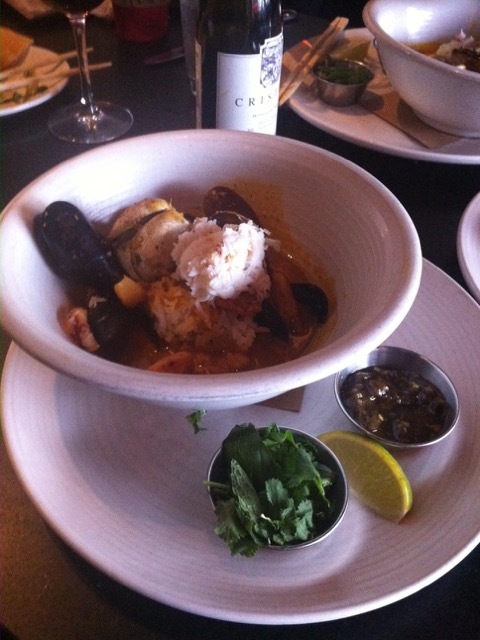 With our final event completed for the year, we decided to celebrate with an excellent lunch at the nearby Trestle on Tenth. 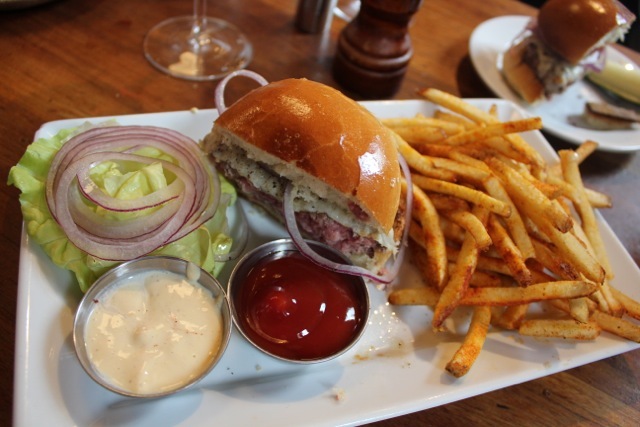 We toasted over wine and enjoyed sharing the Brook Trout with Chanterelles and Roasted Cauliflower, followed by a perfectly cooked to rare and delicious Dry aged Beef Burger with exquisitely crispy and flavorful shoestring French fries, dusted with paprika. A grand finale to an amazingly successful and enjoyable tour filled with events, old friends and new, family, bloggers, radio hosts, and culinary professionals. More events, however, are already slated for next year from Dallas to upstate New York to mile high Denver. We are grateful to the brilliant team at our publisher Houghton Mifflin Harcourt for their support and creative ingenuity. PHOTO 1 fante's door front Philadelphia, where I first met Julia Child on TV over 50 years ago, was our final city of this year's tour. 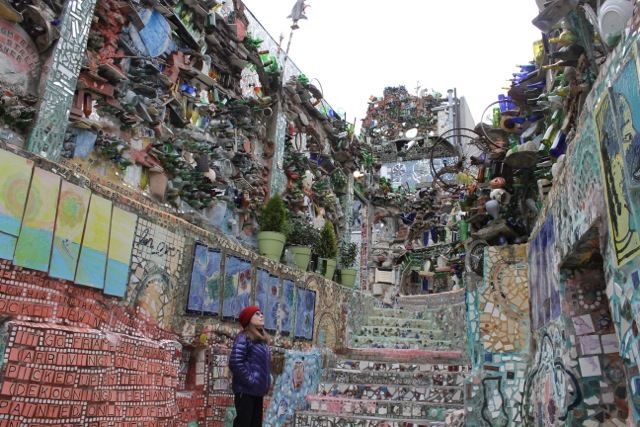 We were heading to Fante's in the Italian market, one of largest kitchenware stores in the nation, for our first event, but when we learned that it was only a 10 minute walk to the Philadelphia's Magic Garden, and had a little extra time, we decided to make a short detour. Woody had visited this incredible mosaic garden with his T'ai Chi group in 2000. 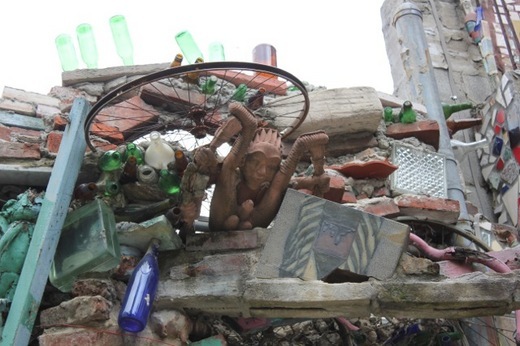 Using an old vacant lot as his 'canvas,' artist Isiah Zagar constructed his magical garden of archways, grottos, and walkways using items that might have been considered to be junk to others, such as discarded glass bottles, broken mirrors, old bicycles, porcelain tiles, and myriad other objects. 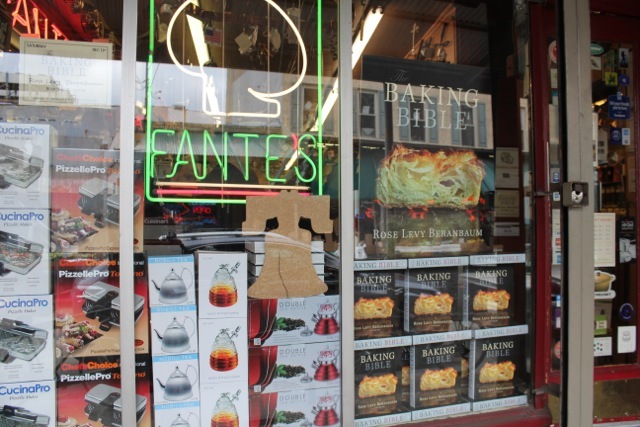 Fante's, owned by the Giovannucci family is located in the heart of the Italian Market, which is open year round, both indoor and out, with sidewalk tables laden with produce and other farmers market items. We were welcomed by Mariella Giovannucci Esposito with one of Phily's traditional sandwiches, the Philly Cheese Steak, before sitting down to a waiting line of people bringing up our books to sign. The staff made my chocolate chip cookies to offer to all patrons to enjoy. 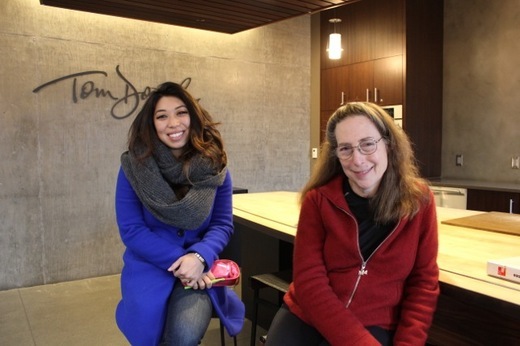 I especially enjoyed talking to Erica, who grew up in the Cajun region of New Orleans, and we sang the praises of the beloved chef Paul Pruhomme, whose "Cajun Magic" spices is now in just about every supermarket in the country. I was also delighted to see John Zagat who had recently moved to Philadelphia with his wife, my couusin, Aison Butterfass. Alison wasn't able to come but John purchased some books for family presents. 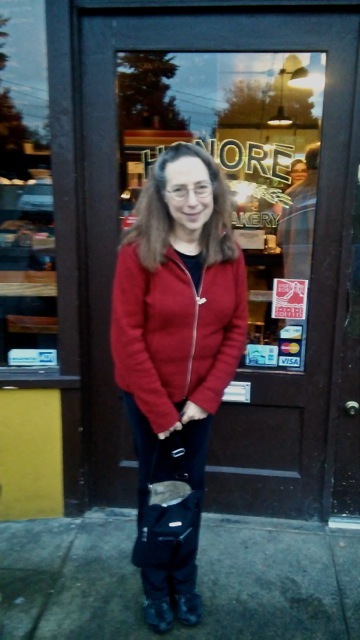 My long-time friend Rhea Denker, whom I hadn't seen for too many years, came by with her husband and then joined us for coffee and for some wonderful and catching up on what has transpired since last we met. Then off we drove to Chef Anthony's Italian Market in Chadds Ford--an hours drive away. I first met Anthony Stella many years ago. At the time he was a restaurateur in Delaware but we met at a mutual friend Fritz Blanc who owned the famed Deux Chiminees in Philly. Anthony sent me an old-time recipe he had unearthed, with the hope that I could improve it and it went on to become one of my all time favorite cakes: the Whip Cream Cake, now in "Rose's Heavenly Cakes". 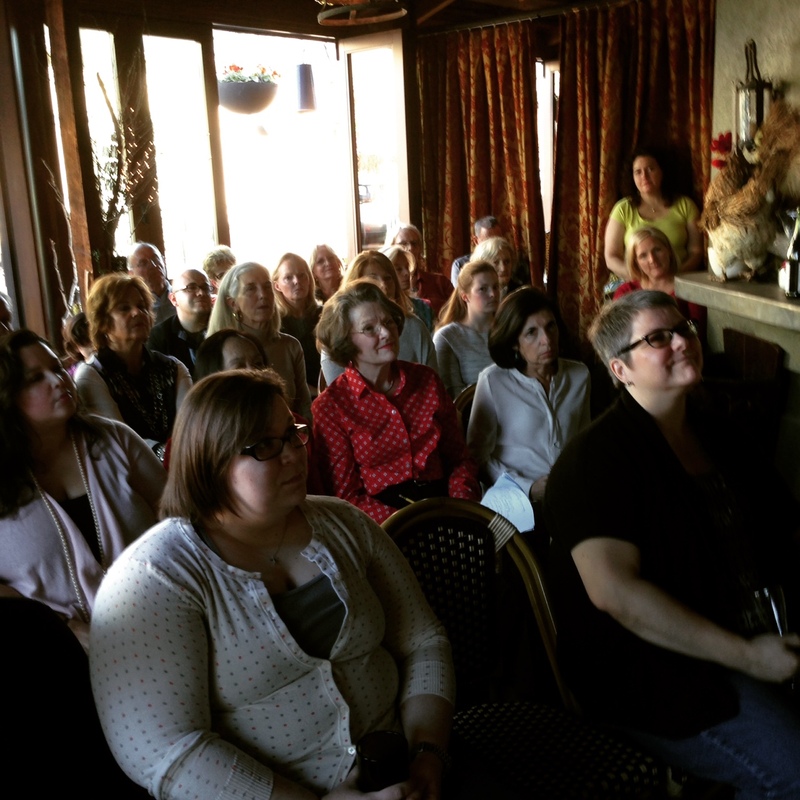 When we entered the front of Anthony's shop, tables were filled with attendees and their stacks of books. After my telling the story of how Anthony I met, we gave an informal discussion and Q & A while everyone enjoyed of our English Dried Fruit Cake served on toothpicks. 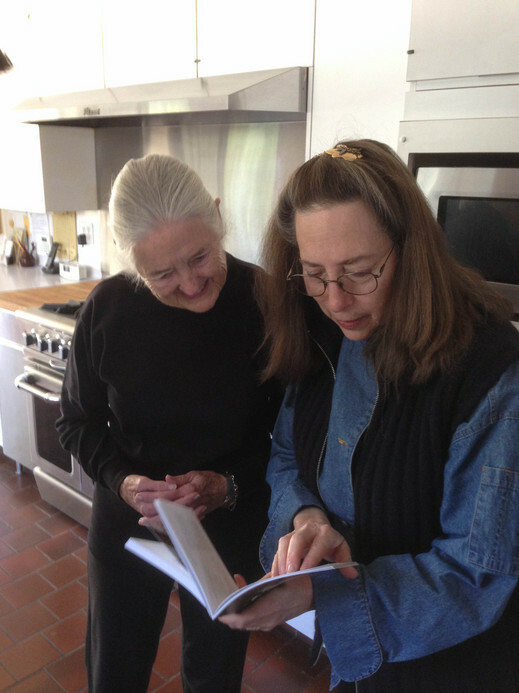 We were delighted to meet Cindy, one of Harold Kitchens' bloggers each of whom had made a recipe from The Baking Bible to post of her blog and offered a give away of one of the pieces of my product line. Anthony and his charming wife Amy treated us to a fine dinner at their favorite retaurant, the award winning Harry's Savoy Grill. 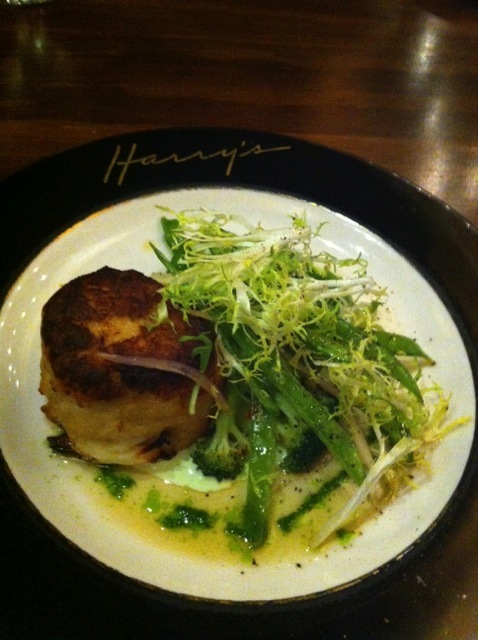 We dined on exquisitely prepared lobster, crab cakes and scallops. 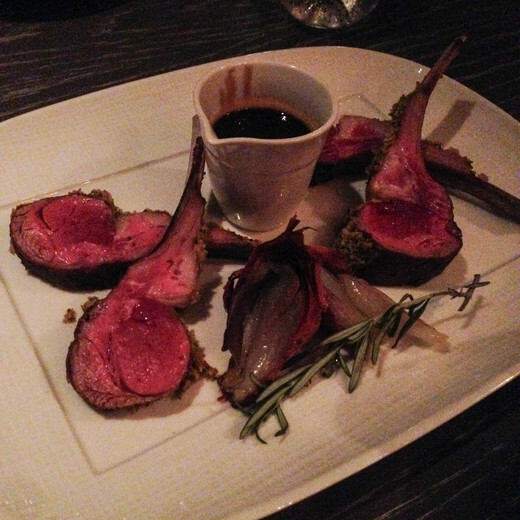 Chef Patric D'Amico is a master at blending complex flavors and we savored every mouthful. Our third and last event was a demonstration lecture at The Kitchen Workshop in Paoli, PA. Owner, Art Roman and I had never met before but we had a very dear mutual friend, Chef John Clancey which gave us a special bond. Art greeted us with my favorite cookie, perfectly executed--the rugelach that he had made from the book. The seats were soon filled with a group of very attentive and enthusiastic bakers. We decided to demo the Praline Pecan Meringue Sandwich Cookies as they are so delicious, quick to make, and quick to bake. They came out of the oven text book perfect--crisp on the outside and slightly chewy on the inside. They cooled quickly so that when Art brought out three flavors of ice cream, everyone was able to top a cookie with a scoop of his or her favorite flavor. 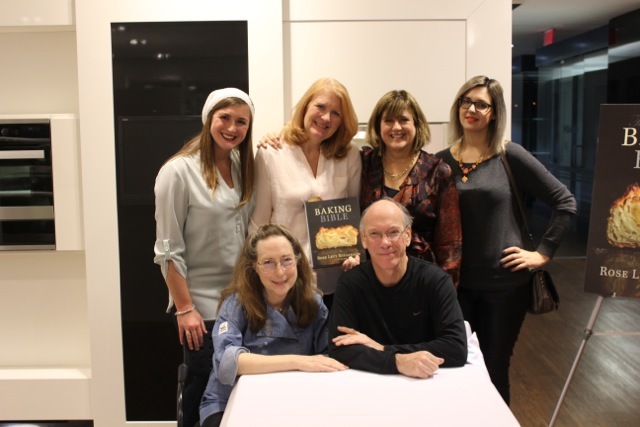 And yes, there were seconds, but we were too busy signing books to indulge! We loved meeting Emily Ryan who writes for several of the local newspapers. Thanks to her we have the great photos of the event. 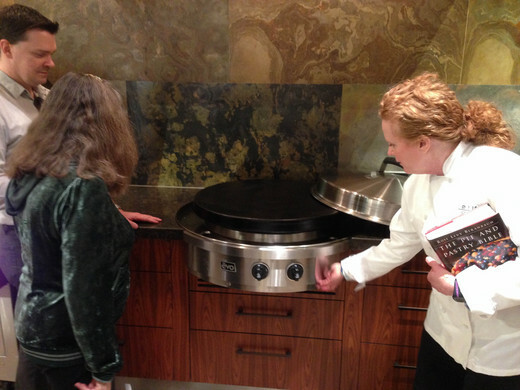 After the book signing, I was amazed and touched when Art brought out an unusual present--a 1800's metal cake carrier. It is currently filled with a wide variety of pasta from Anthony's store. 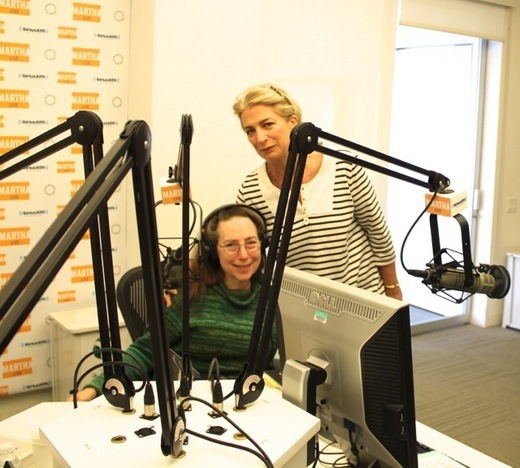 Our whirlwind multi-city tour to conclude, with a final return to the Big Apple for the Martha Stewart Radio Show--next week's posting. Just back from Washington DC where Sunday night, at the International Association of Culinary Professionals annual conference, our book won the award in the Baking Savory or Sweet category. How gratifying, after all those years of work, to receive such a validation and honor. Chef Central in Paramus, NJ I was especially looking forward to this event as Chef Central is featured under favorites on "Sites I Like" on my blog home page. I knew they carried an enormous assortment of culinary tools but actually seeing it in person was staggeringly impressive. Our appearance, which included a demo and talk, was part of a KitchenAid all day baking event in the store. 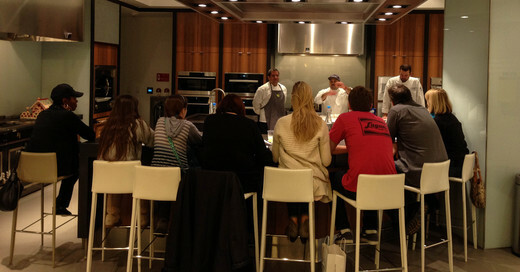 The Chef Central teaching staff were giving a baking class for kids when we arrived. As we were setting up our equipment, we were able to have our Nespresso afternoon coffee break on site offered by the rep of the Nespresso booth. One of my favorite demos is making my Red Velvet Cake, as it is vehicle for us to show and talk about all of my major golden rules and tips as the spectacular red batter mixes in our KitchenAid mixer's glass bowl. Along with signing books, I signed a photo of myself to join the many other chefs and culinary professionals, who have done events in the past, gracing the Chef Central's back wall. 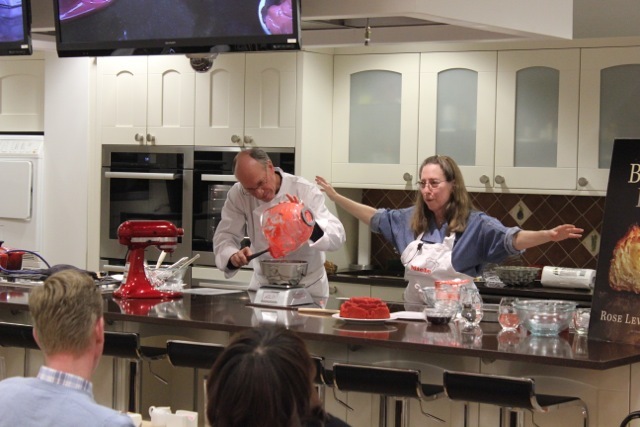 I had been immensely looking forward to our event at the Miele Center in Princeton, New Jersey as I have been and still am a long time fan of Miele appliances. When we arrived in Princeton, it was cold, snowy, and lunch time so we decided to restore our strength at the cozy Teresa's Cafe, an Italian restaurant. 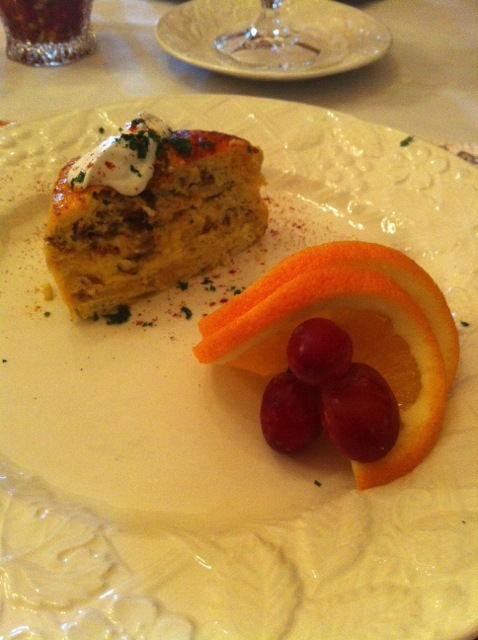 The food was fabulous. 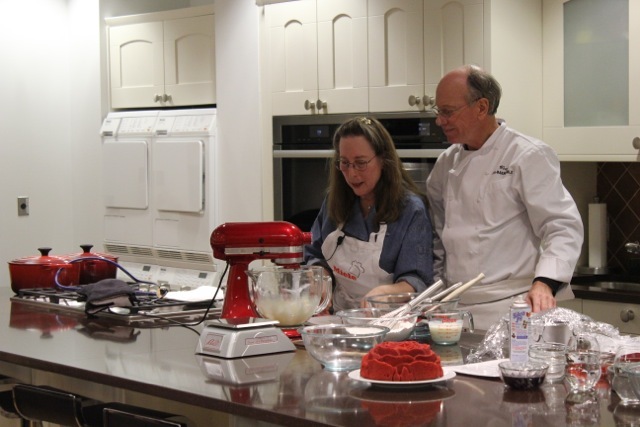 Along with our demonstration of the Red Velvet Cake, the kitchen staff of Miele had generously made several recipes from The Baking Bible to serve to the 61 attendees before the class began. 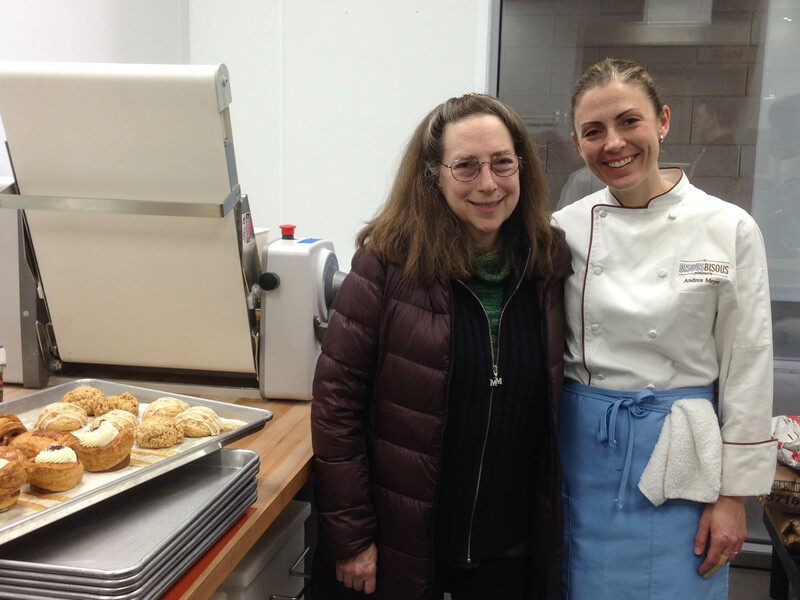 In the reception area outside the kitchen classroom, a long table was adorned with The Bourbon Pecan Butter Balls, Kourambiethes, The Red Velvet Cake, and the savory Pizza Rustica, along with champagne and other beverages. Miele did a first class mis en place for us as we arranged our set up while attendees began streaming in with their plates laden with our recipes. Tracy Kuchar, director of special events, introduced us to the class which began, once again again with our video featuring over 37 photos from the book. Our book signing session took over an hour with everyone wanting us to sign all their books, which included several of my past books. We were especially pleased to meet Tracy's mother and grandmother who were responsible for her a strong baking foundation. 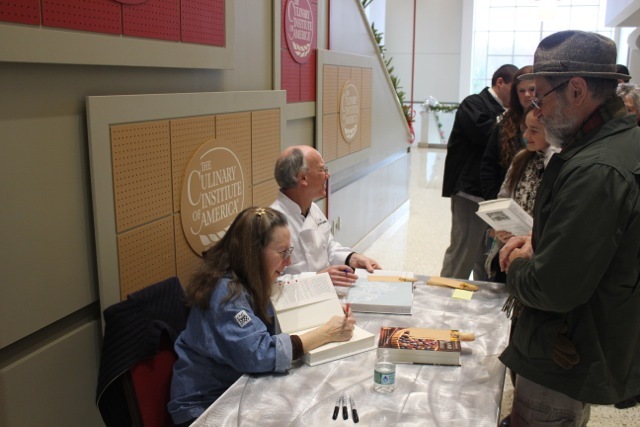 A mother, her daughters, and friends were the last group to have us sign their books. We also signed several books for those who could not attend the class and one turned out to be the chef/owner of Teresa's Cafe. The next day, on our way out of Princeton, we returned to Teresa's for another sustaining lunch before heading home. And on to planning the weekend ahead-- a trip to Philadelphia, with three special events--next week's posting. 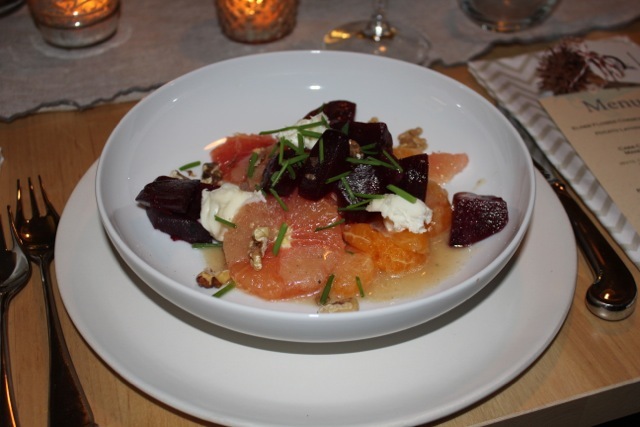 For the evening celebration, we headed over to New Paltz for a grand dinner in the home Agnes Deveraux, which is adjacent to our favorite New Paltz restaurant, her fabulous Village Tearoom restaurant. We were greeted warmly with an elder flower champagne cocktail accompanied by crunchy potato latkes topped with house-made gravlax. 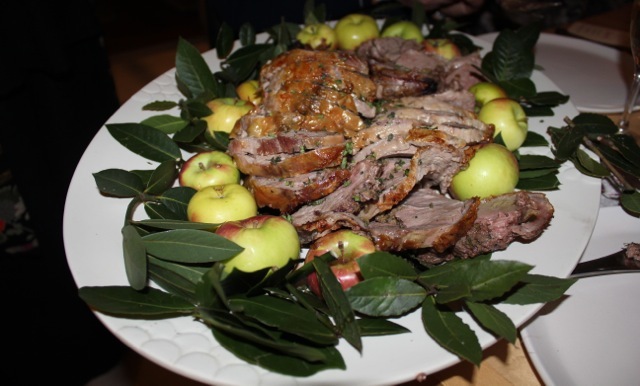 As you may remember the blog posting about the incredible dinner she made, featuring confit of Hudson Valley duck at Billiam van Roestenberg's Liberty View Farm. Dear Agnes remembered my mentioning that duck and lamb are my two favorite meats and to my delight leg of lamb was the main feature of this nights dinner. 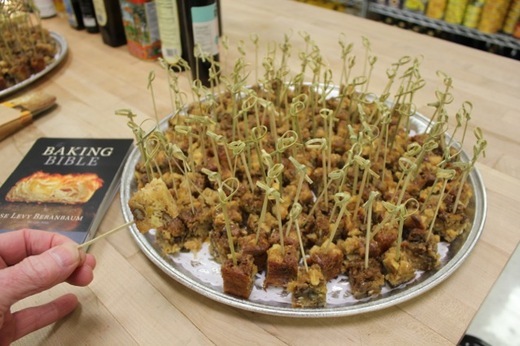 The lamb had a savory stuffing which was from the Union Square cookbook (Agnes had been a chef there). Agnes is a fantastic host and pulls out all of the stops for her 10 joyful guests seated around the dining room table. The first course was a delicious beet and cara cara and navel orange slices, with a walnut vinaigrette. 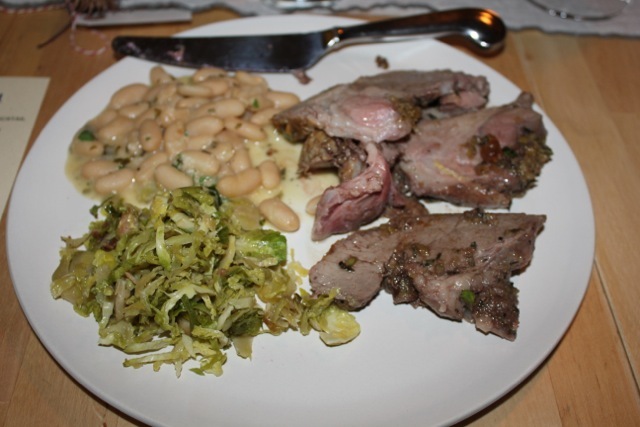 The Tuscan beans were perfectly cooked and incredibly flavorful, and the shredded brussel sprouts called for several helpings. 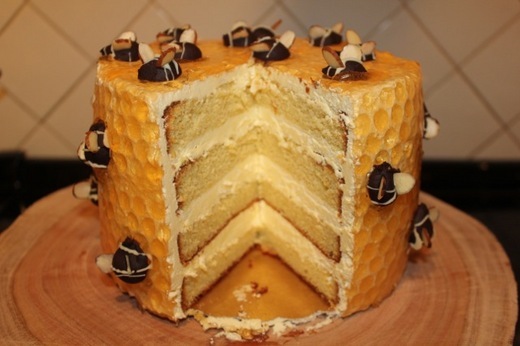 For dessert, we all ate slices of her signature Honey Bee Cake, which she frosted to resemble a bee hive, patterned after my Honeycomb Chiffon Pie in "The Pie and Pastry Bible," and a traditional Buche de Noel chocolate log roll cake complete with meringue mushrooms. It was accompanied by Vidal Ice Wine, Jackson Triggs, Niagra. In addition to the wonderful food and company, the highlight of the evening for me was meeting Gar Wang and her husband Ron Gee. One of Gar's many artistic talents making felted clothing. 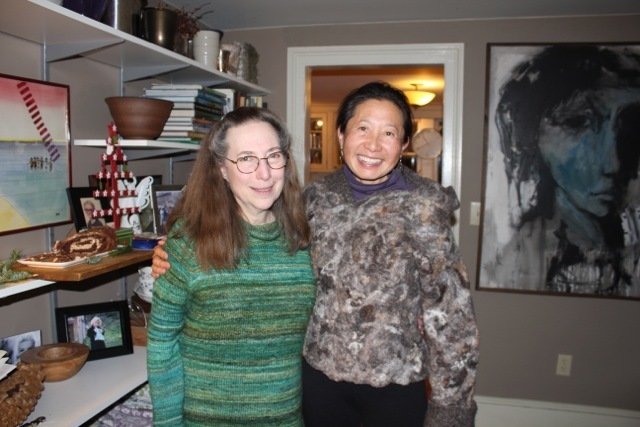 She was wearing this incredible one piece top made from felted wool, and hand formed with her hands. Actually she described the strenuous process which involves stretching a huge length of the wool using one's entire body. While I was talking to Gar, Woody relished the opportunity to practice the partner aspect of T'ai Chi, doing push hands with Ron in the living room. Before too long most of us were engaged in learning a bit of T'ai Chi or T'ai Qigong. 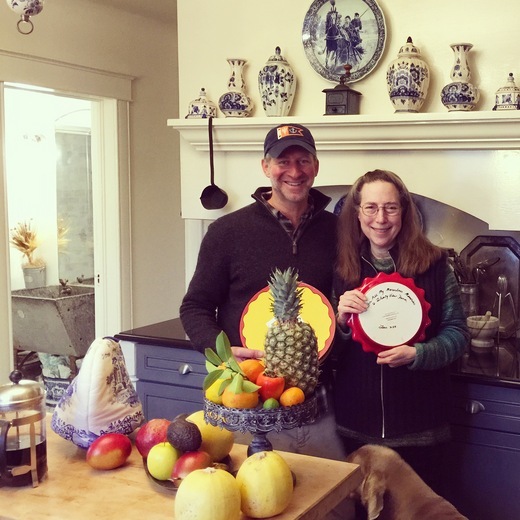 We returned to Billiam and Rene's Liberty Farm to enjoy their warm hospitality as we did a month earlier. Our house gift was the "Rose's Perfect Pie Plate," which Billiam insisted I sign and date. Rene's scrumptious scrambled eggs breakfast, not to mention the two delightful dogs who have now stolen our hearts, made it hard to leave. The following morning, we drove to Miele in Princeton: next week's posting. 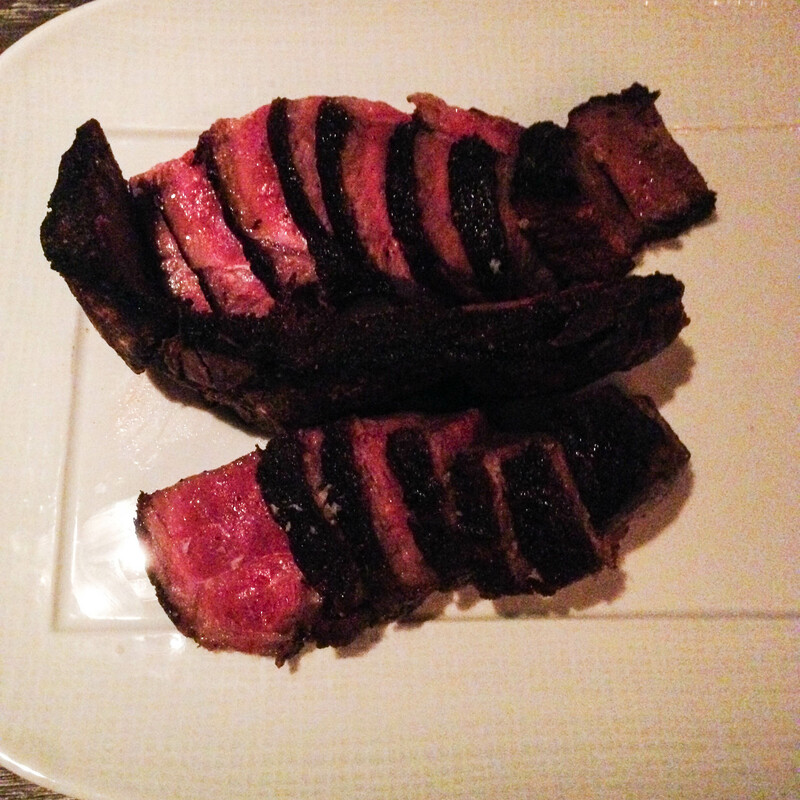 Chef/owner John Tesar's Knife is purported to be one of the best steakhouses in Texas. Hedda and Cherif (of Rise Restaurant) joined us as we sat down at our table. But something looked odd, as there was an extra placemat and my being seated next to the unoccupied seat. Suddenly, to my stunned surprise, I heard Jean François Bonnet's voice as he walked by me to his chair. JF is one of my dearest friends and is co-owner of Tumbador Chocolate in Brooklyn. When I first met him, 20 years ago, I knew with certainty that he would become one of the world's top pastry chefs, but he went on to exceed my expectations by also becoming one of the world's top chocolatiers. He immediately explained that he was in Texas for meetings with two of his top accounts: Whole Foods and Central Market. Zach, being a first class chocolatier, not to mention master of arranging happy surprises, had contacted JF to join us for dinner. 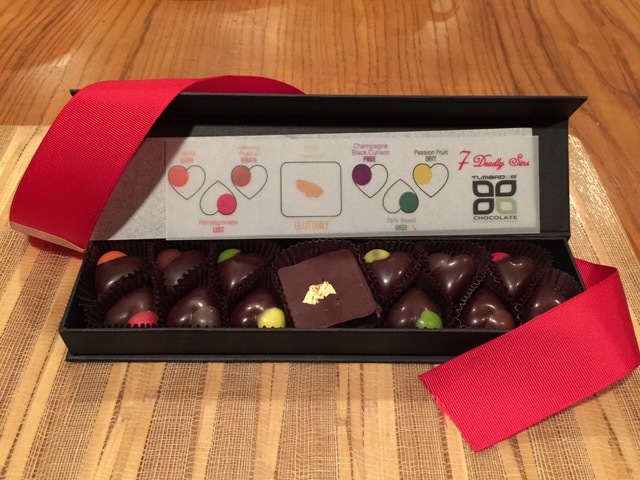 JF, of course, brought samples of his exquisitely delicious chocolates. Dinner commenced with an appetizer of the signature half of a Crispy Pig's Head that was first presented to us before being carved up and served with tortillas and three sauces. 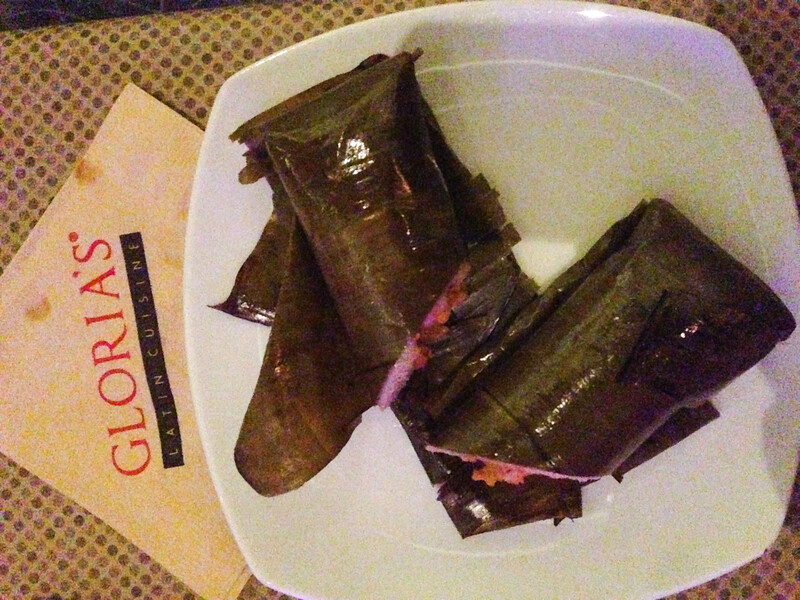 It was a fantastic combination of succulent and tender meat and crunchy skin that would have served for the entire dinner but... Chef Tesar sent out several dishes for us to share including duck confit risotto, penne with black truffle essence, and my favorite or the three--oxtail ravioli. While the others shared dry aged bone in sirloin and rib eye steaks, we enjoyed one my favorite meats" Rack of Colorado lamb. 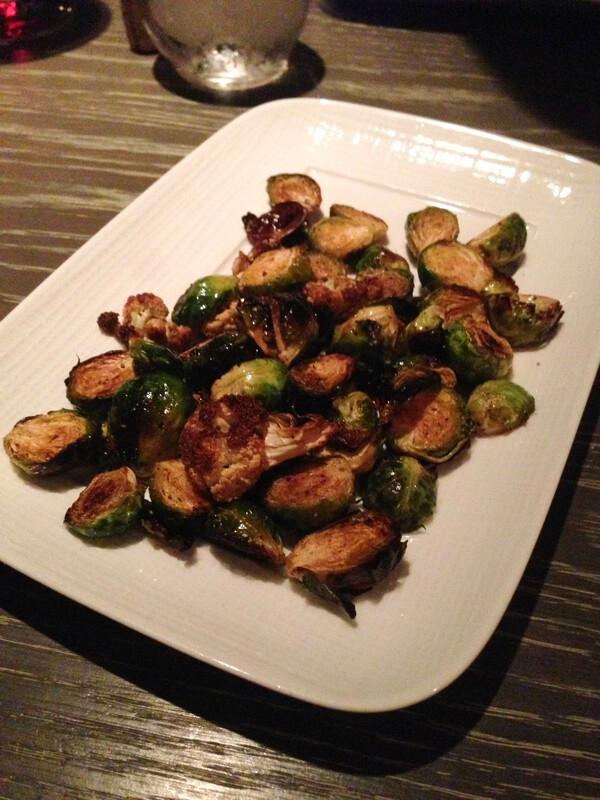 Roasted brussel sprouts were the side dish. 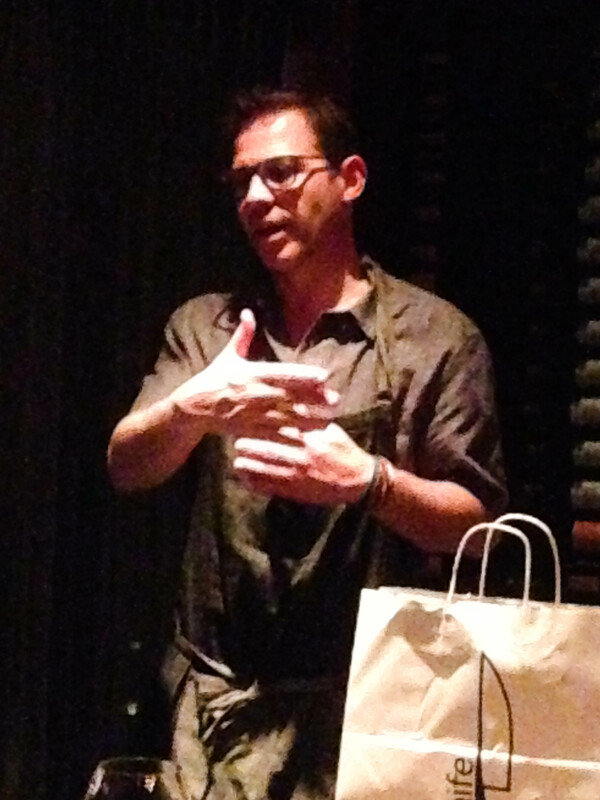 Chef Tesar then came out to chat with us and to allow our filled tummies to relax before his dessert finale offering. Six desserts soon filled our table presented by the gracious pastry chef, who gave us detailed descriptions of each. 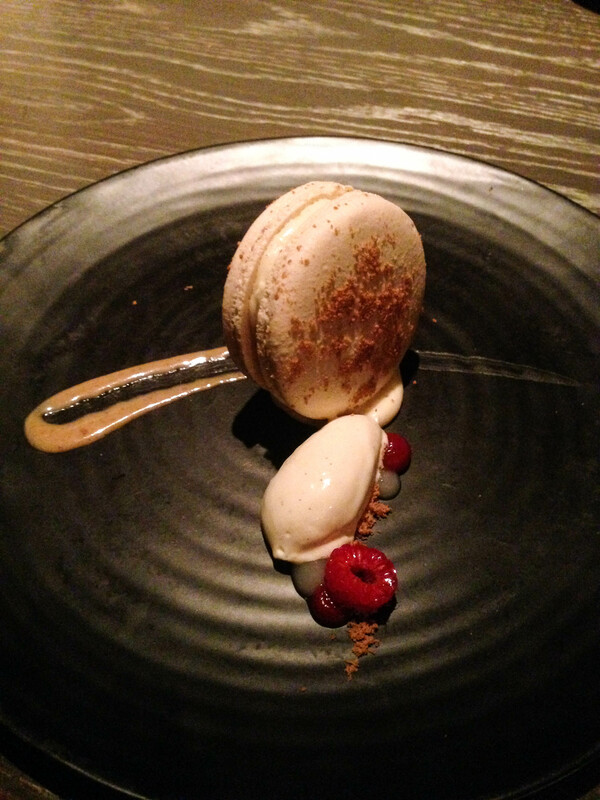 Each had several components including caramel pretzel, an apple tart, chestnut mousse, varying consistencies of chocolate, and cheesecake sandwiched in macarrons. Midnight sounded as we arrived home to Zach's after many goodbye hugs and still more conversation with JF. Zach is not only a wonderful friend, he is also the consummate host, so it will come as no surprise that Woody and I were hoping that the predicted sleety, snowy weather for New Jersey and New York would translate to a cancelled flight and another day chez Zach. But off we flew with the comfort of Hedda's invitation to bring us back for more events in the future for the opening of the newest Rise restaurant in Houston. 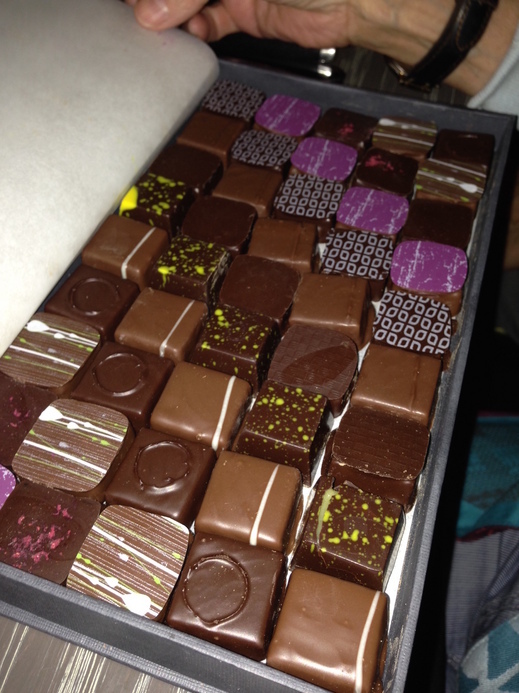 And time flew by as we delved into the doggie bag of now cold but still delicious pig's head followed by a variety of hard to resist Tumbador chocolates: But we mananged to save these for later! A return to upstate New York for my first time as a presenter to the students of the Culinary Institute of America (CIA) at Hyde Park. We arrived a few hours ahead of our presentation to meet with David Slonkosky and his staff who prepared the mis en place for our demo. We were impressed that to ensure we were covered for any problems, it was prepared in duplicate. We also visited the lecture hall to get an idea of how we were to present our demo and lecture, and were given a tour of the campus. 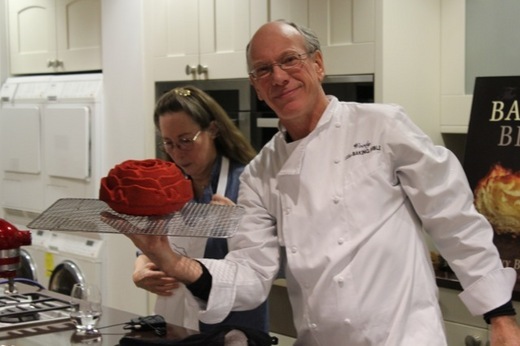 My good friend, John Zearfoss, whom I first met over 25 years ago when he was a chef at The Trellis in Williamsburg, Va, is now creator and head instructor of the CIA's newest addition, the Culinary Sciences department, gave me a grand introduction. 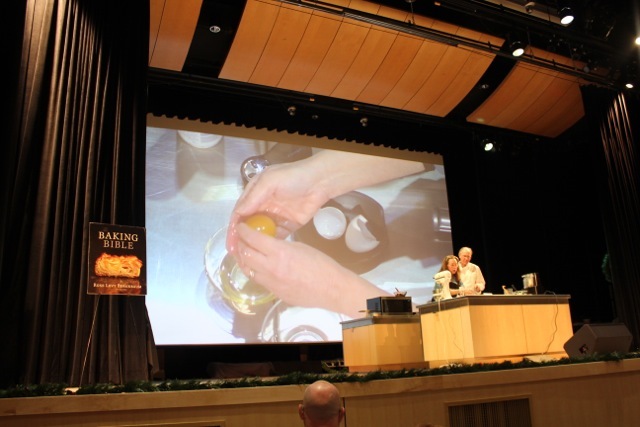 Before a filled auditorium of over 300 students, visitors, and instructors, we showed "The Baking Bible" video. 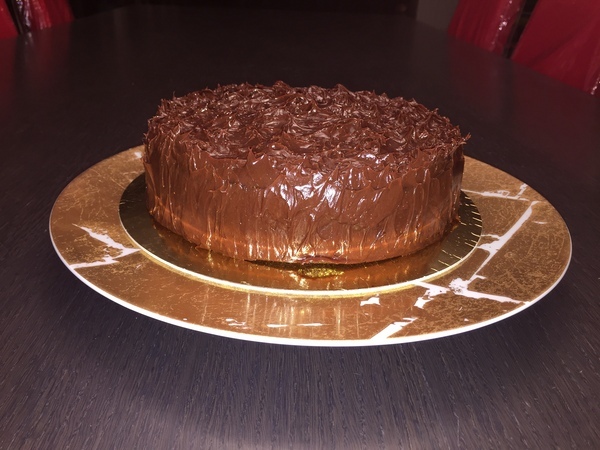 We then made one of my favorite chocolate cakes from all of my books, The Chocolate Pavarotti with Wicked Good Ganache, which provided a platform for highlighting virtually all of my golden rules for baking. We then showed over a dozen slides of our numerous tests to illustrate their importance in researching and engineering recipes, as many of the students are interested in pursuing careers in the area of food science. Afterwards, to our delight, our book signing table seemed like it had a perpetual line of visitors. We were enchanted that one of our long time bloggers, Ed, drove 5 hours from Niagara Falls to attend the lecture and see us in person. 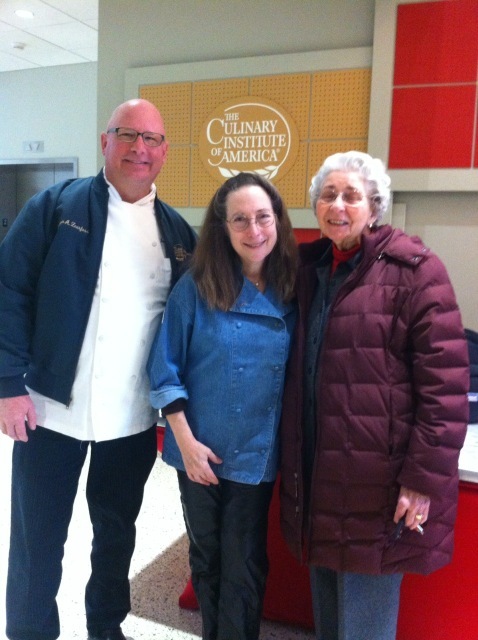 I had invited my dear friend Betty Van Nostrand, who is indisputably the queen of cake decorating, and teaches at the CIA, to come to the lecture and we had a chance to catch up after the signing. 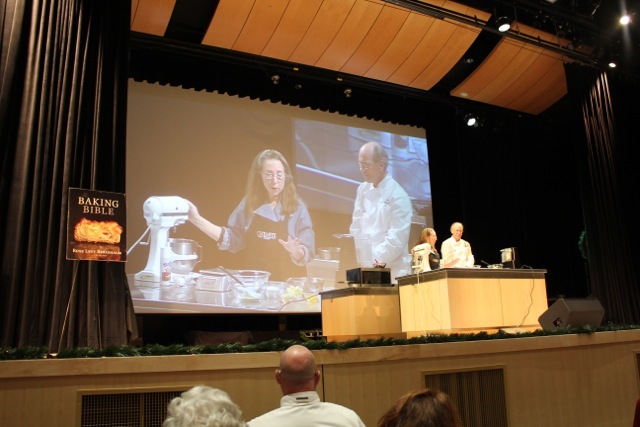 Though it was getting later than anyone had anticipated, we weren't about to leave before visiting the very impressive Culinary Science Laboratory. On our way there we were treated to a view of a unique wall collage. 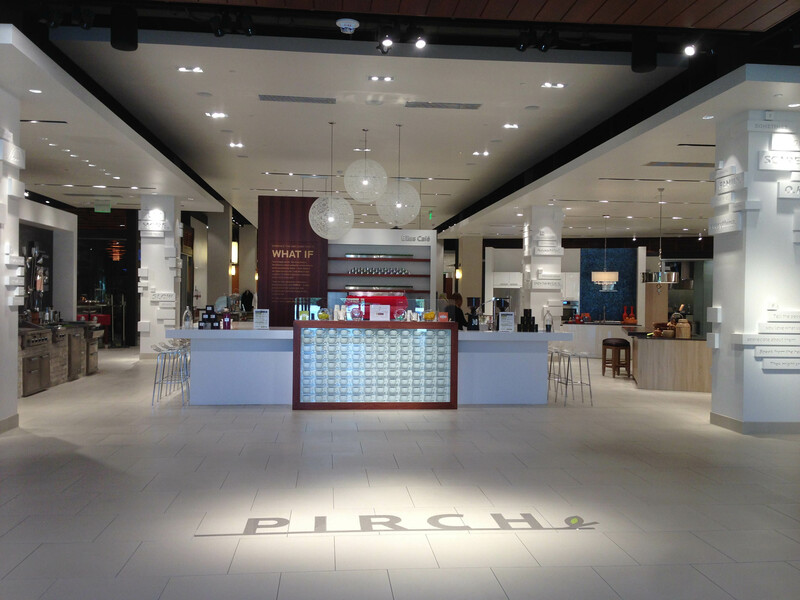 A sunny Sunday morning paved the way to meet Connie at the Pirch showrooms. 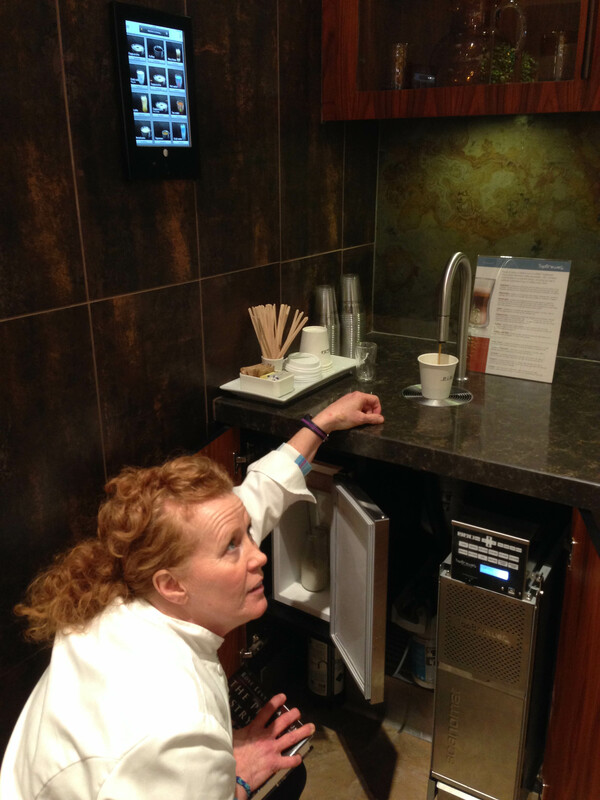 We were awe struck by the latest in kitchen and bathroom technology and designs. A fully equipped, state of the art, coffee and tea bar staffed by a barista, offered us cappuccinos to enjoy as Connie escorted us from room to room. 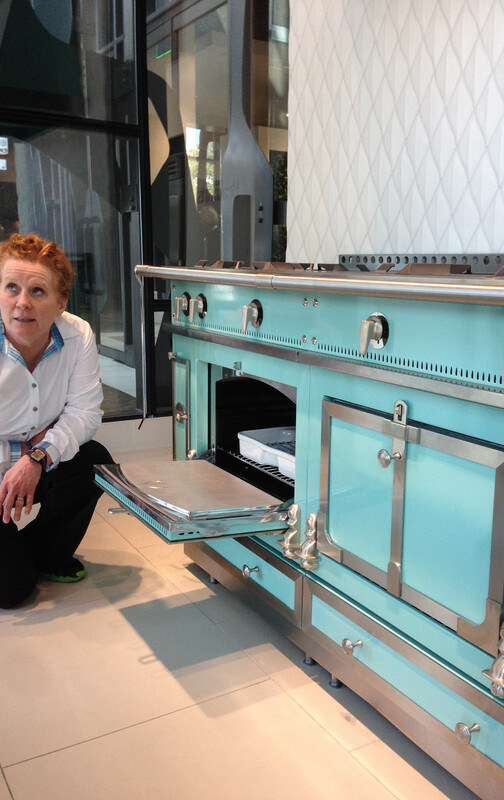 Pirch rotates one of the top-of-the-line ovens from a manufacturer every 90 days for her and her staff to test and make recommendations for the sales staff and their clients, who are invited to bring their own baked goods to test out in the ovens. Along with showing us Miele, Gaggenau, Aga, Wolf, Thermador, and several other ranges, we got to see the latest grills, an in-wall rotisserie, a bread and pizza oven wall oven, and even a built-in computerized coffee maker for $12,000! A huge show room was dedicated to showerheads with a shower enclosure that enables a client to try out by actually taking a shower. Pirch also conducts top level cooking and baking classes free of charge. 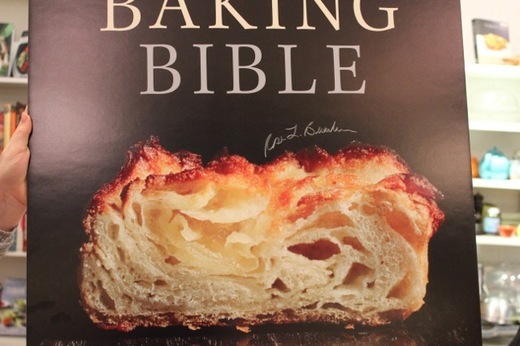 Today's class was on making éclairs and, to my delight, they were using and also selling my Pie and Pastry Bible. 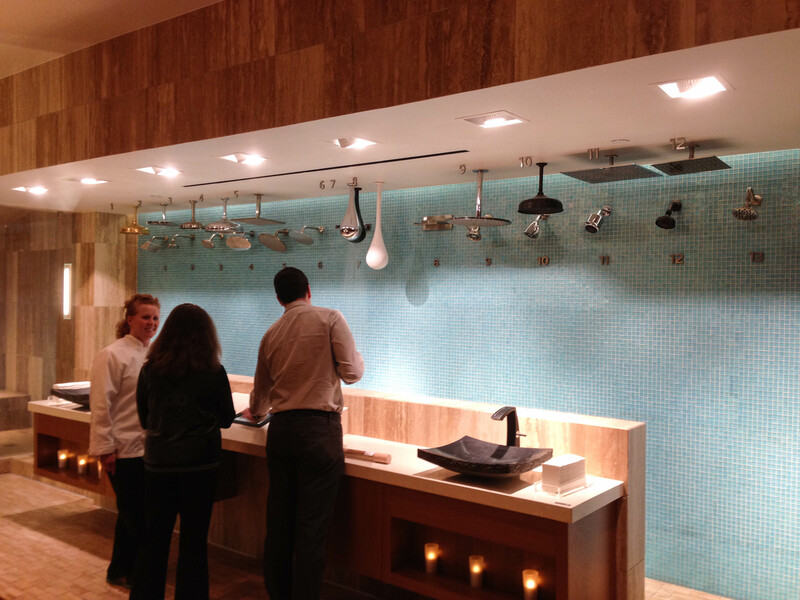 Connie informed us that New Jersey's Paramus Garden State Plaza will be the next Pirch showroom, opening this March. 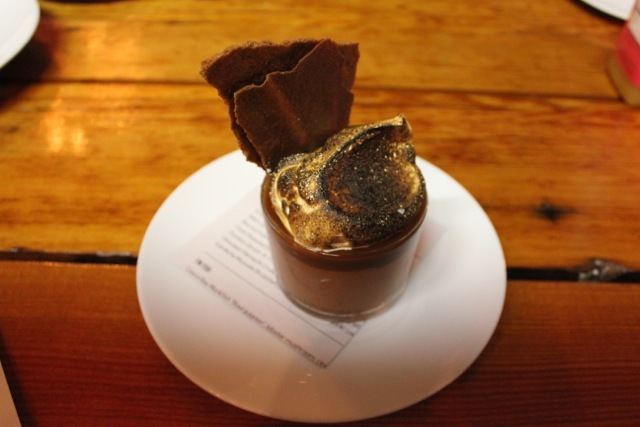 We returned to Zach's for a light lunch and conversation on different methods of tempering chocolate. The evening plan was to celebrate the successful events thanks to Zach's fastidiously detailed planning. 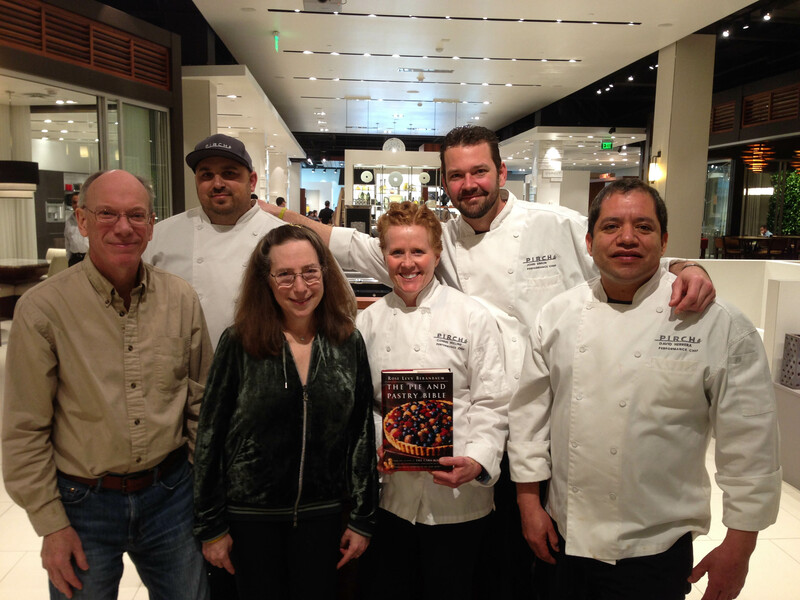 Then it was off to Rise Restaurant, this time for a talk and book signing. We were all seated on the patio and there were about 20 guests. Woody brought Pepparkackers from the book and Hedda served sparkling cider. 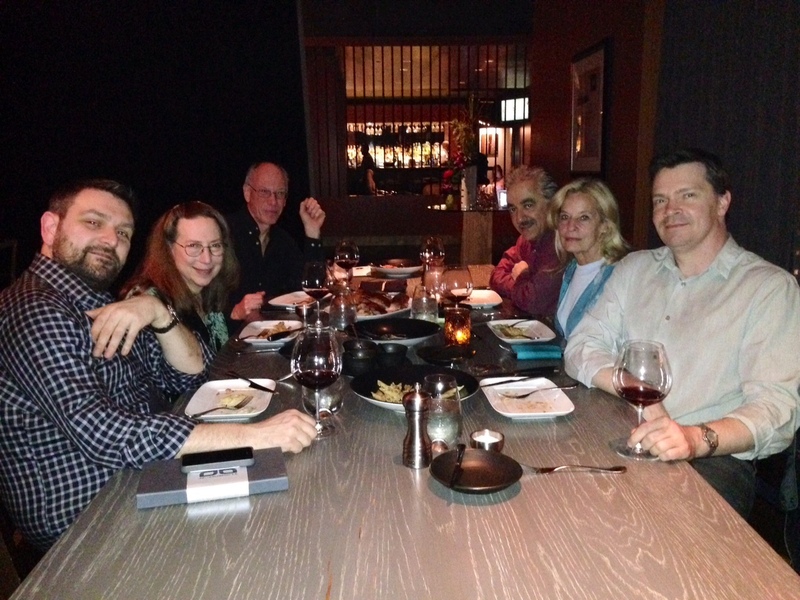 We then headed back to Zach's to rest up for our grand diner finale at Knife. Back home in northwestern New Jersey, half of our tour still to come with events throughout New Jersey, New York, and eastern Pennsylvania. 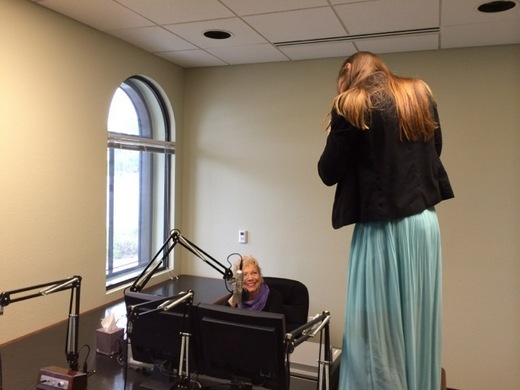 This included several radio interviews such as the one with my long-time friend June LeBell pictured above. 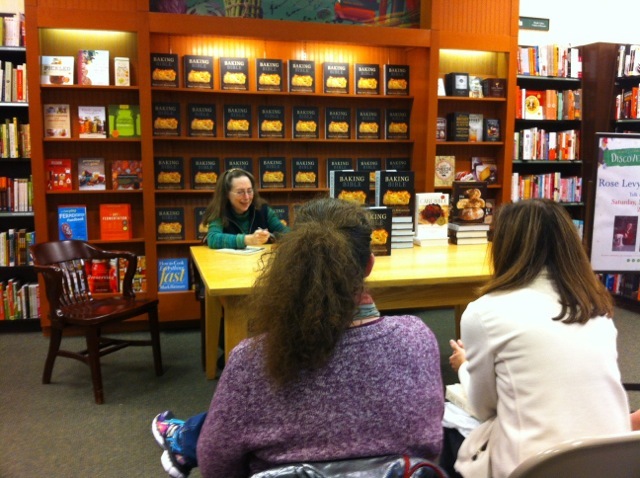 First stop for a week of steady events was the Barnes & Noble in Somerville, New Jersey. A few years ago, we had stopped by the store on an impromptu visit and signed several of my books from the book shelves. The manager invited us back for a talk and book signing event when our book (which was still in the testing phase) would be released. We did the usual talk, Q & A, and book signing. The following Monday afternoon was a return to our local WNTI public radio station's studios at Centenary College. My dearest high school classmate, June Lebell, who for most of her career was a major host on WQXR, now is the host for her June Lebell's Radio Show on WUSF, out of Sarasota, Florida. Radio DJ and WNTI's operations manager, John Del Re(aka Johnnie Dee), greeted us in his studio where he could setup the special connection for June to interview me. 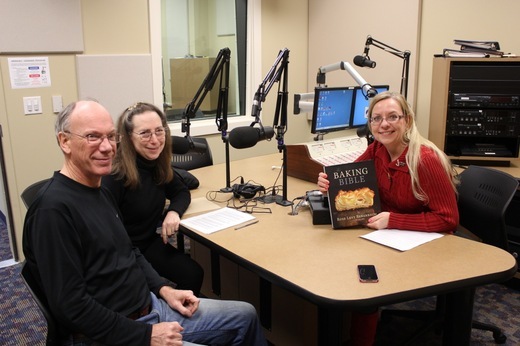 June and I had a blast, covering a wide variety of topics and, as usual, linking music with baking, which was especially appropriate because two of the cakes in "The Baking Bible" were dedicated to opera singers (Pavarotti and Fleming). 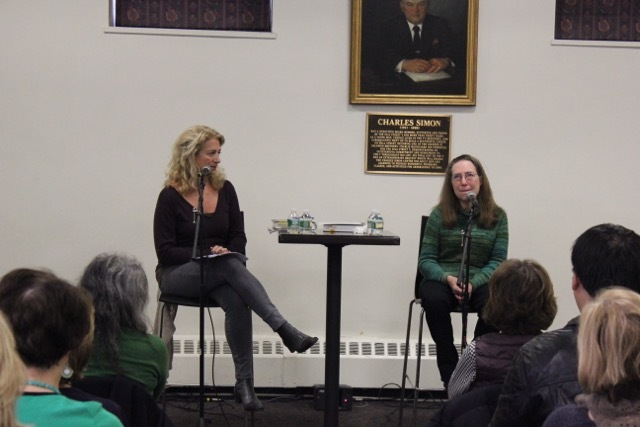 Two days later, it was off to New York City for a book conversation with Lucinda Scala Quinn at the 92nd Street Y. I grew up in this Y so it was a special treat to have my first lecture there be for this special book. Lucinda, who is one of the best moderators ever, began the discussion by asking me about the inpact of the Internet on the cooking and baking community. We then talked about my golden rules and tips for baking from the book. 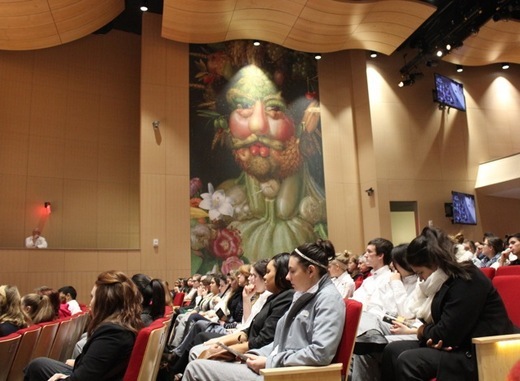 The 92nd Street Y lecture series attracts a wide variety of interesting people which led to a lively Q & A that followed the lecture. 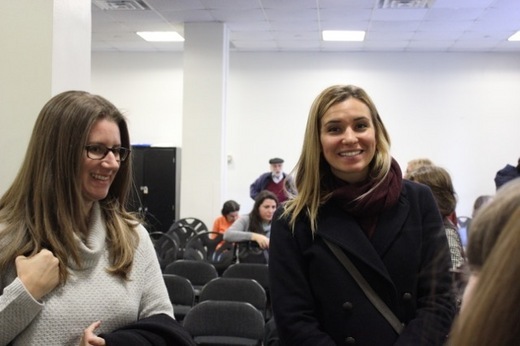 I was delighted that my editor Stephanie Fletcher and marketing manager Allison Renzulli attended the lecture and came up to say hi before we signed books. 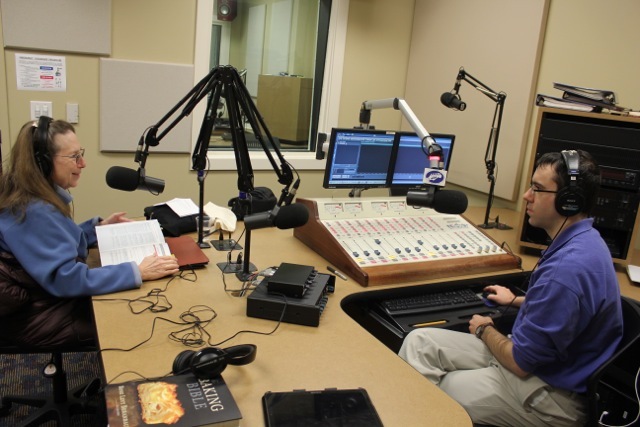 The following day it was back to WNTI for another radio interview accompanied by Elliott. 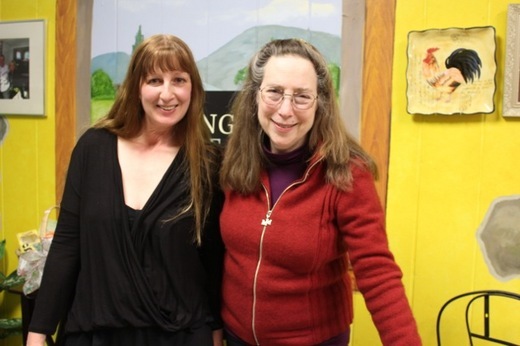 This time, it was with WNTI's own host the effervescent Melanie "Dawnbird" Thiel for the taping of her Contours Show which airs on Sundays featuring repartee with various people of interest in the community. This invitation evolved from Woody having been a guest DJ on her morning music show. Elliott had always wanted to meet Mel, as he had heard her show many times. We had a delightful discussion of the book and of my baking philosophy, with Woody chiming in, contributing his perspective. 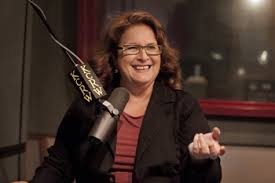 We returned once again to WNTI for an interview with Evan Kleiman of Goodfood, out of KCRW, Los Angeles. 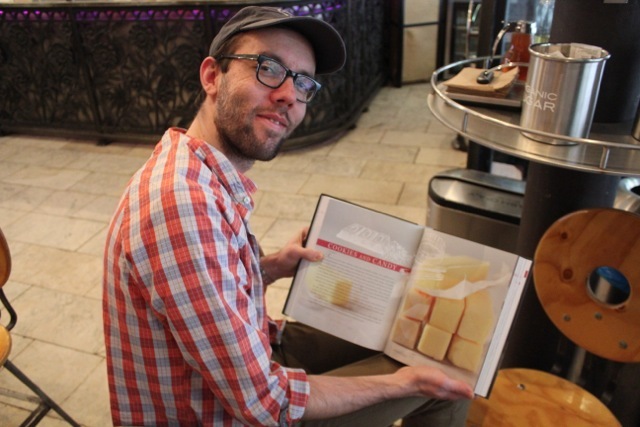 I always look forward to talking with Evan and this time it was on one of my favorite subjects: baking equipment. Zach had hoped for us to meet pastry chef Andrea Meyer at the Chandler event but as Andrea had just opened her new patisserie, Bisous Bisous, a few days before so was unable to attend. Instead, Zach drove us over to meet her. Andrea gave us a tour of her kitchen, where we met one of her assistants, Molly Wilkinson who was making a tray of macarrons. Molly had recently returned from studying at the Cordon Blue in Paris and we were charmed by her enthusiasm and love of baking. 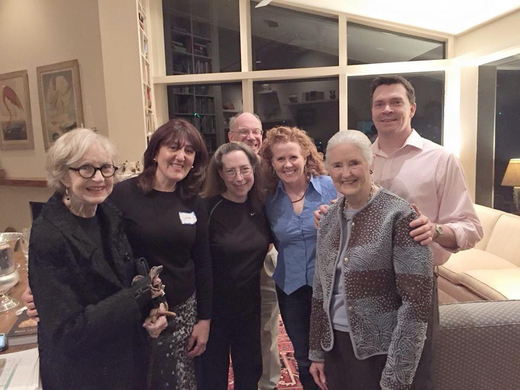 It turned out that coincidentally; Molly's mother was planning to attend the Chandler event. 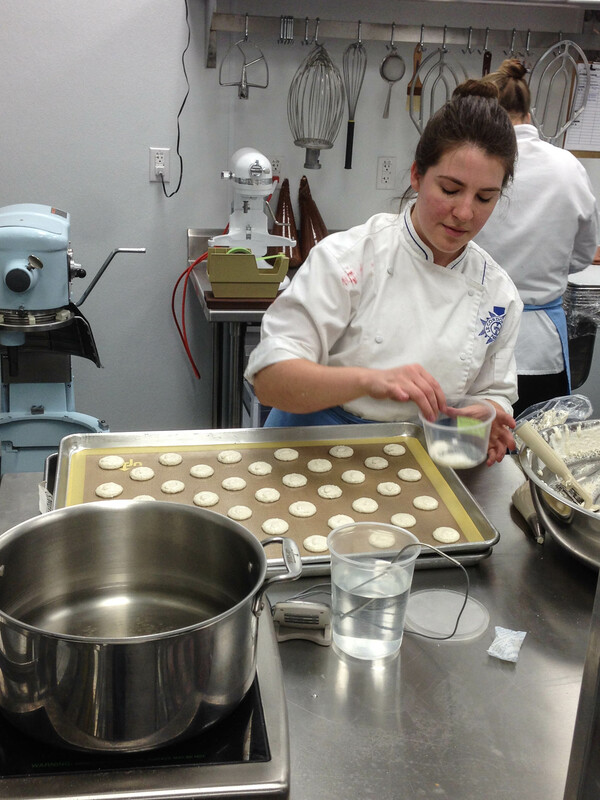 Andrea recounted how she and her husband had moved temporarily to California to do a stage at Bouchon Bakery in Napa, and we envied her the experience of working with Thomas Keller. 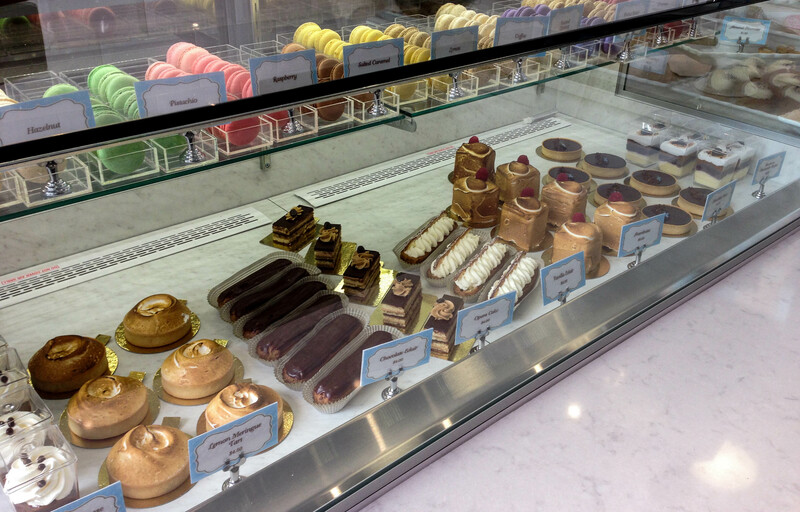 We then picked out a selection of Andrea's wonderful pastries to enjoy outside of her shop. Dallas is so lucky to have this exquisite place. 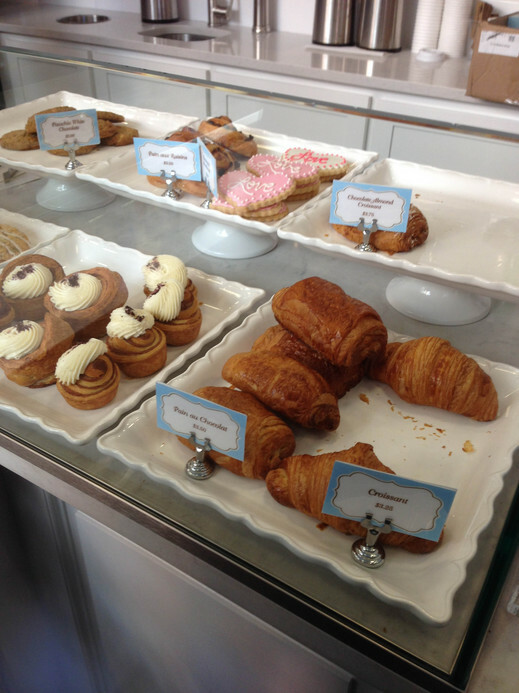 The croissants were among the best I've ever experienced. 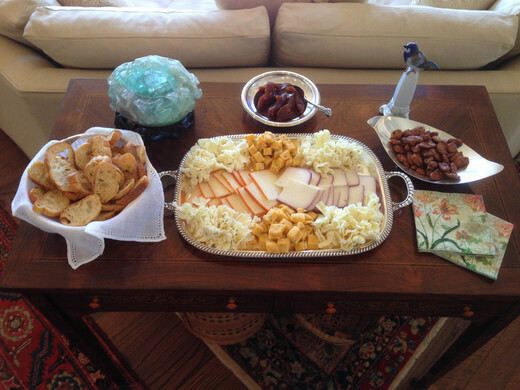 In the afternoon, we arrived at Chandler's where she and Hedda Gioia Dowd, co-owner of Rise restaurant, arranged trays of hors d'oeuvres and champagne for guests to enjoy on their arrival before the demo. We were delighted finally to meet Joan Wade, who baked through Rose's Heavenly Cakes with the Heavenly Bakers; was part of the Beta Bakers testing team for The Baking Bible; and now is an Alpha Baker for our Baking Bible bake through group. Joan came all the way from Houston for both the Chandler Event and the Rise event the following day. Orin Lagbas, who just joined the Alpha Bakers a few weeks ago, came to see us and brought her future mother-in-law as well. To start the event, Zach asked each of the 23 people present to introduce ourselves and talk about our baking experience. We were charmed to discover that Chandler's daughter Chandler, who is a veterinarian, was part of our group. 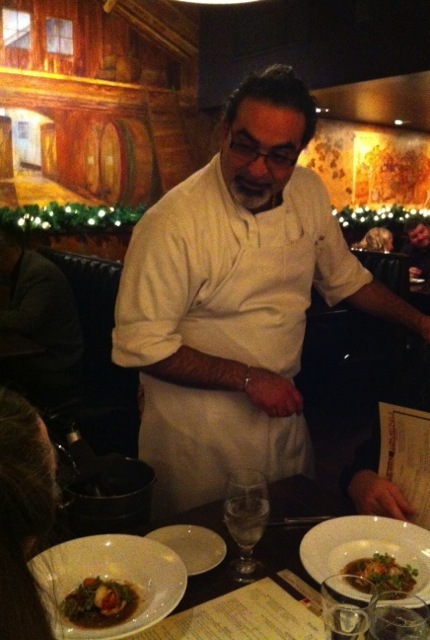 The only male presence other than Zach and Woody was the charming chef Cherif Brahmi, co-owner of Rise Restaurant. 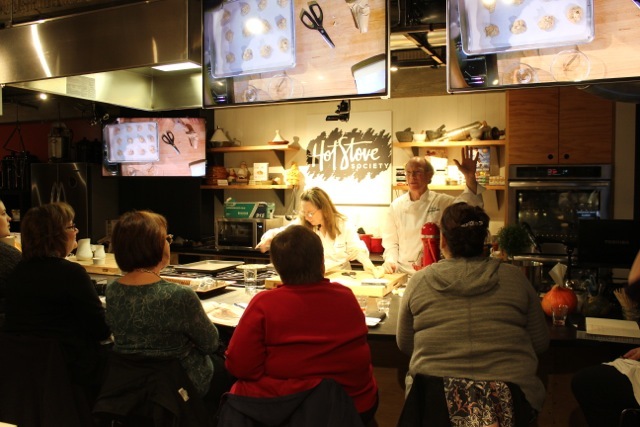 We then moved to kitchen for my demonstration on making the The Praline Meringue Ice Cream Sandwich Cookies and my tips on baking. I also gave the history of creating the Deep Passion Chocolate Cake and the Wicked Good Ganache as Zach and Woody served slices to the attendees. When the meringue cookies had cooled after baking, Woody mounded dulce de leche ice cream on each as a second treat for our appreciative guests. The final act was signing all the books and enjoying more conversation. 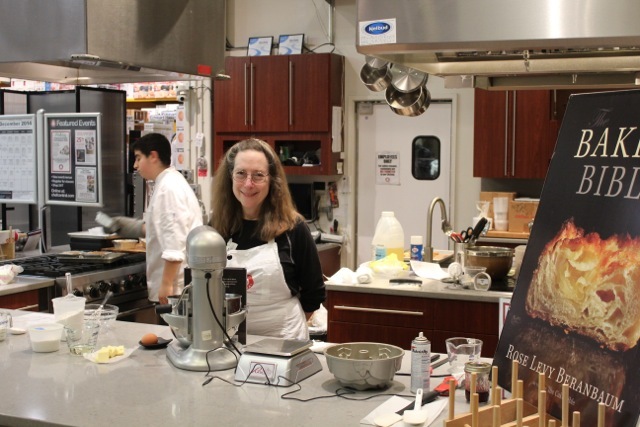 Connie Akins Mullins, chef and kitchen equipment consultant for Pirch's Dallas showroom, brought take home packages of her German Chocolate Cake. At the risk of sounding superlative about everything, please trust me when I say that this was the best I've ever tasted. 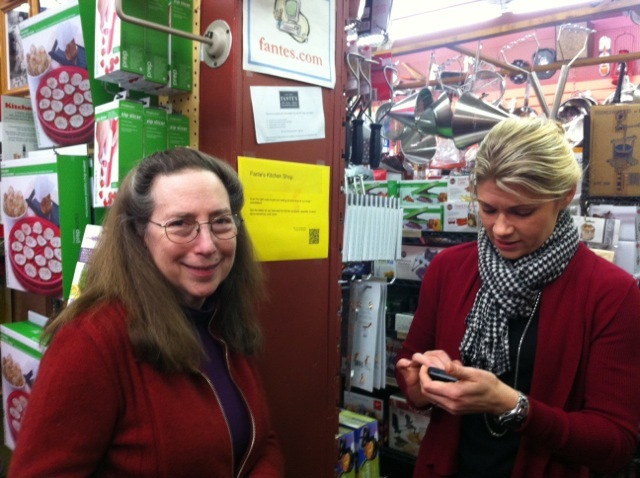 Connie also encouraged us to come for a tour of her store the next day. We signed everyone's book along with more stories and conversation with our many new friends. We asked Chandler to join us at Rise for dinner but she had eaten so much of the desserts she was no longer hungry! 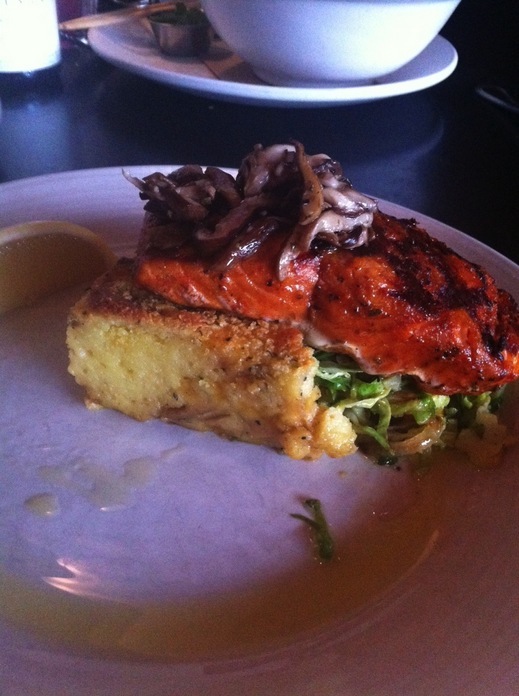 Hedda then treated Zach, Woody, and me to an eagerly awaited dinner of soufflés at her Rise restaurant. 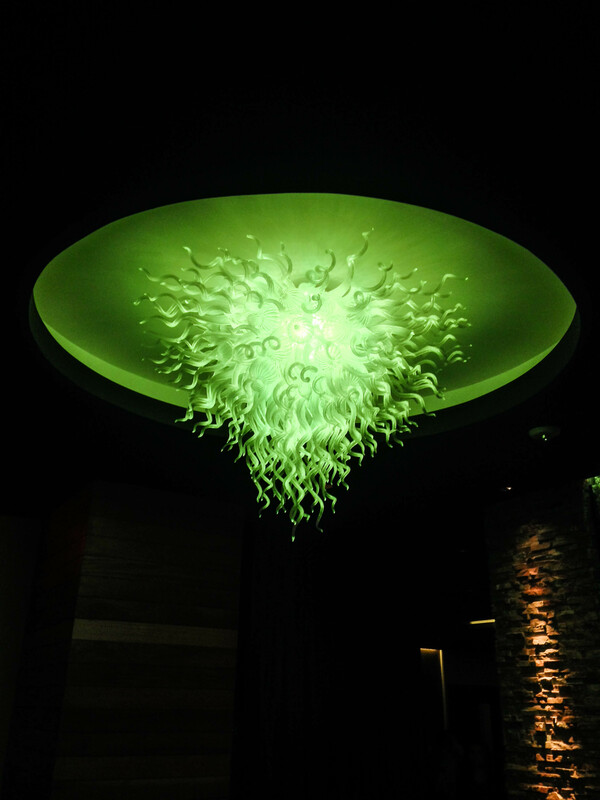 Hedda is responsible for the incredibly creative décor. 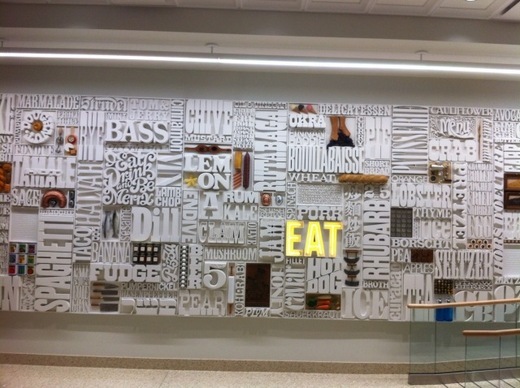 Several of Rise's reserved tables are wooden school desks topped with Scrabble game letter racks that have the name of each guest spelled out with Scrabble letters. 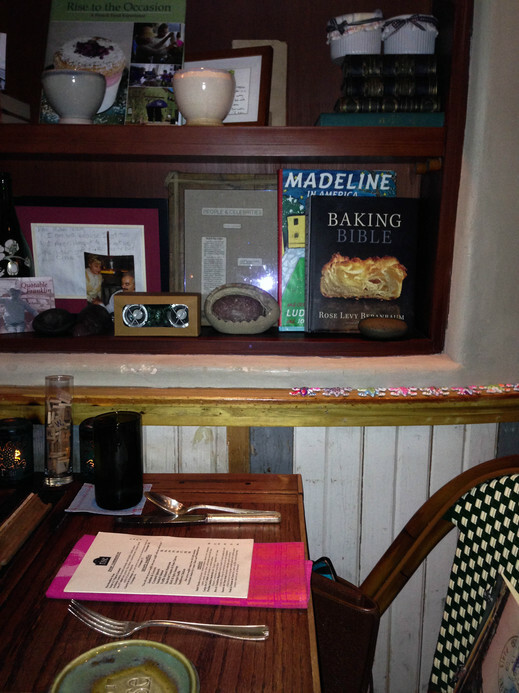 Our Baking Bible was also part of our table area's décor. 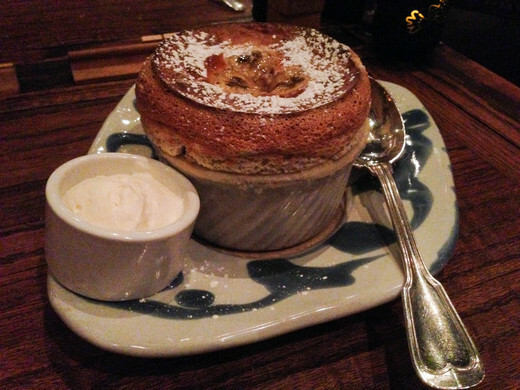 Soufflés are Rise's forte and executed in most every way imaginable. 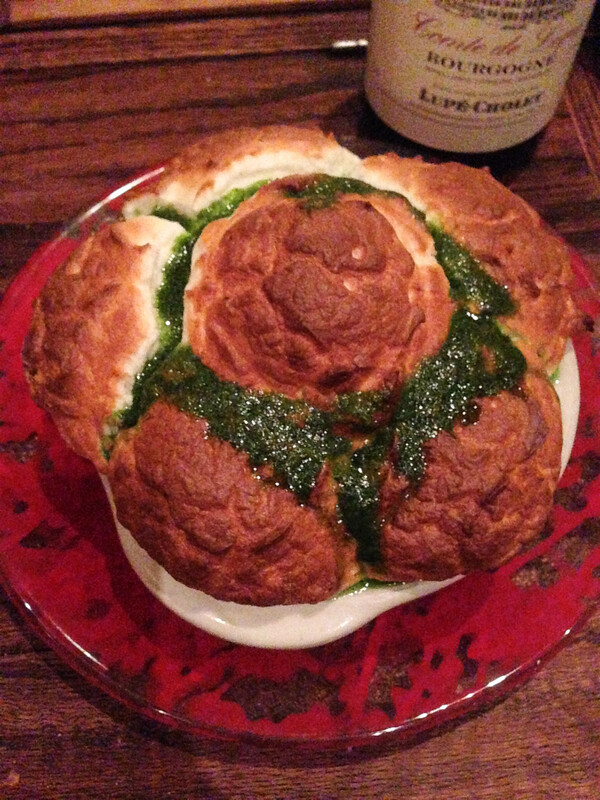 Woody and I shared my top favorite: an Escargot Soufflé. We also enjoyed splitting a special for the night, Crawfish Soufflé. For dessert, we all enjoyed another special soufflé of the evening: Bananas Foster. 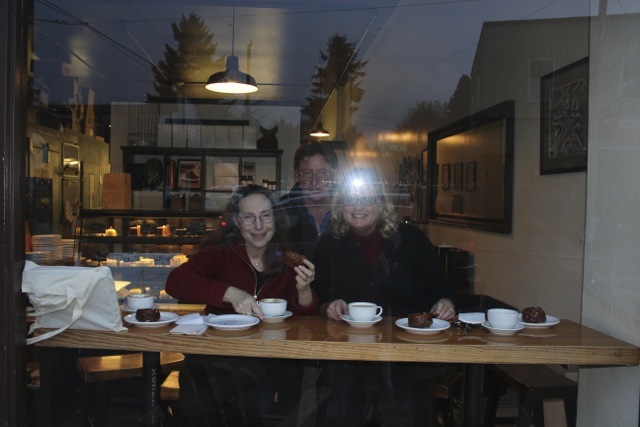 The evening began with my niece Monica Gibbs and her partner, Neil, taking us up to the Honore Artisan Bakery. 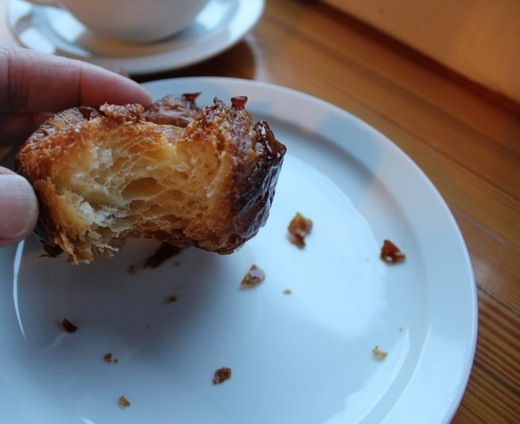 We were told by several people that this was the place for the best Kouign Amann in the Seattle area. 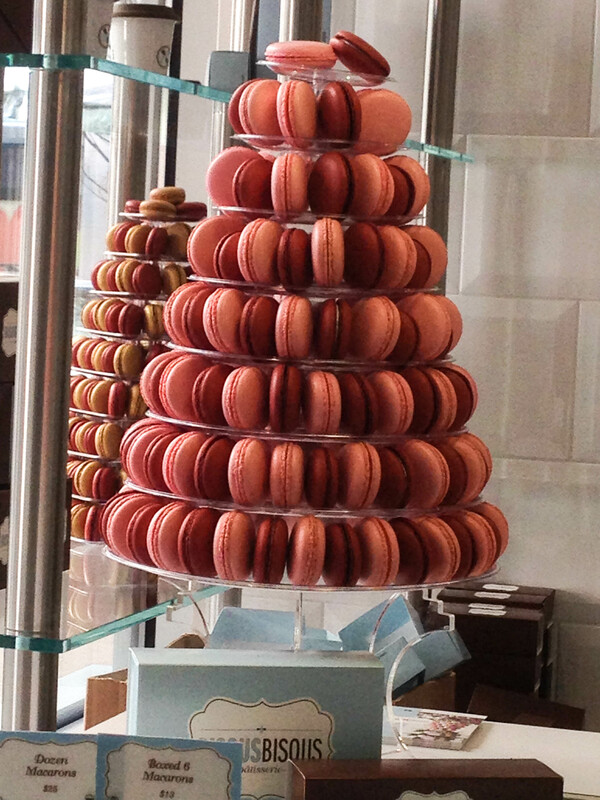 Woody had called in the morning to reserve 3 of them from pastry chef/owner Franz Gilbertson. We enjoyed his delicious Kouign Amanns along with an excellent cup of cappuccino (this IS a coffee town!). 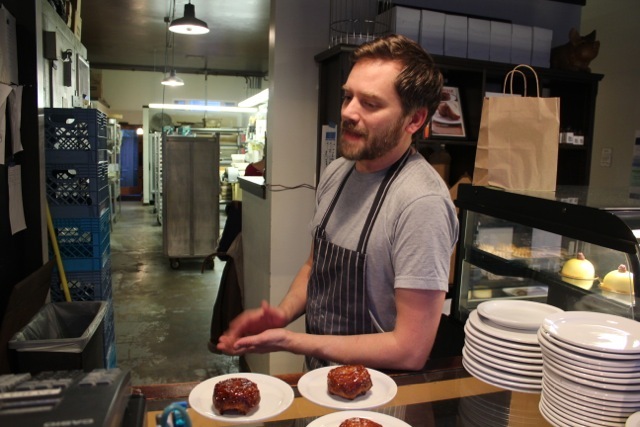 His Kouigns were lighter in texture and more thickly caramelized on the outside but less sugar on the inside than ours. They also had a touch of salt on the crust. 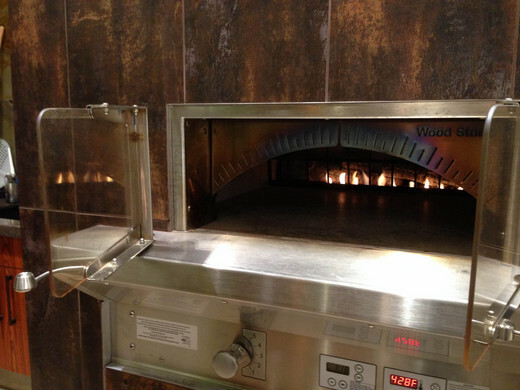 Chef Franz gave Woody a tour of his kitchen, where Woody got to see a pastry sheeter for the firsts time. A pastry sheeter is like a giant pasta roller. It is the most expensive piece of equipment in a bakery and is invaluable for quickly and evenly laminating the dough layers in the kouigns and other pastries. A delightful dinner at the Wild Ginger Chinese restaurant completed our day in style. We enjoyed the Zinfandel from A. Rafanelli, Dry Creek Ca. so much that I ordered a case on our return home. The final day of our St. Louis, Denver, San Francisco, Napa, and Seattle tour began with a Starbucks coffee at the original location down by the bay. 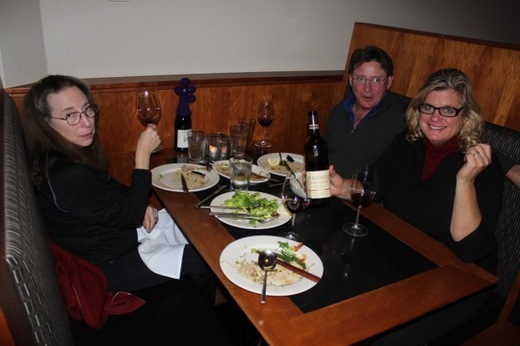 Then lunch at Etta's, which Tom Douglas named after his daughter, to celebrate our last dining experience for this part of the tour. 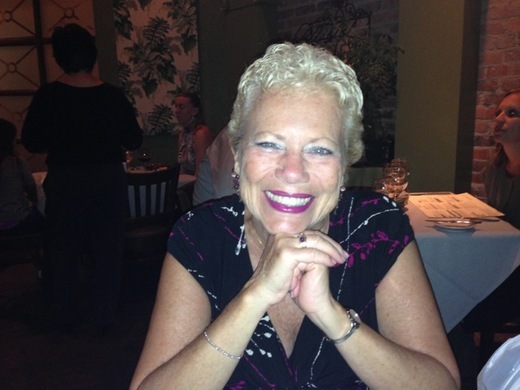 Our exceptionally professional waitress, Andrea, recommended great choices for wine and lunch. We enjoyed sharing oysters, Tom's Tasty Tuna Sashimi with delectable chive pancakes, Tom Douglas' signature Grilled "Rubbed with Love" Salmon, and a Seafood & Coconut Soup Stew. Our plane landed in Newark around midnight for a drive home and a night's rest before next week's posting: Barnes & Noble in Somerville, New Jersey. The last time Woody and I visited Dallas was when our wonderful friend Zach Townsend organized a mini press tour for Rose's Heavenly Cakes. 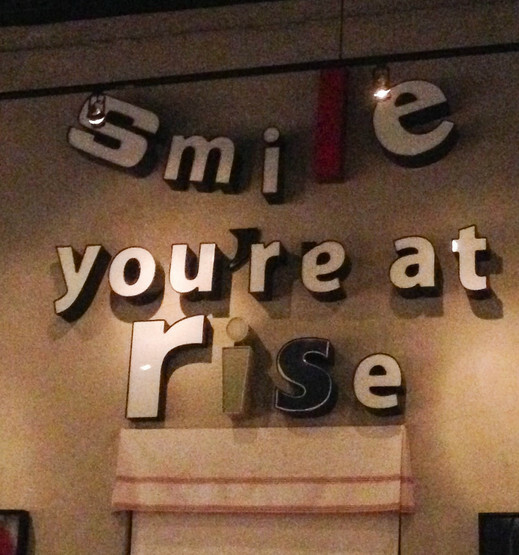 One of the highlights of the visit was lunch at Rise Restaurant. 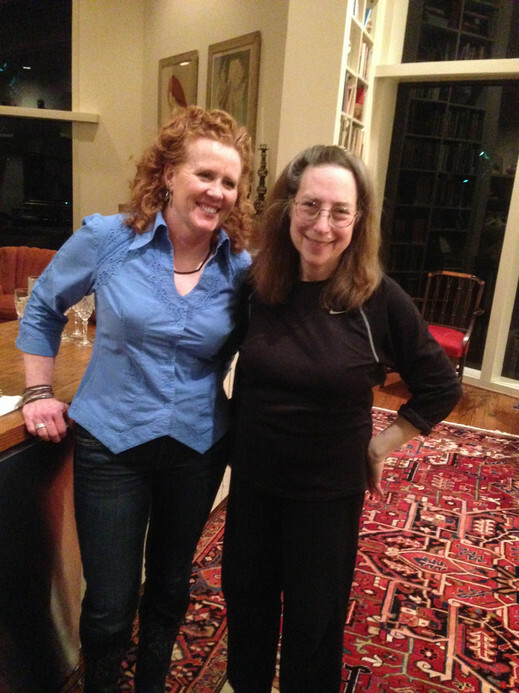 Co-owner Hedda Gioia Dowd promised to give us a book party for the next book--a promise that I treasured and was now fulfilled two years later. Once again Zach packed myriad delicious and fun events into four days that felt like a month's worth of activity. And it sure took work on everyone's part to have this much fun. For our first evening in Dallas, Zach took us to Gloria's, a Latino restaurant serving Mexican and Southwestern dishes. 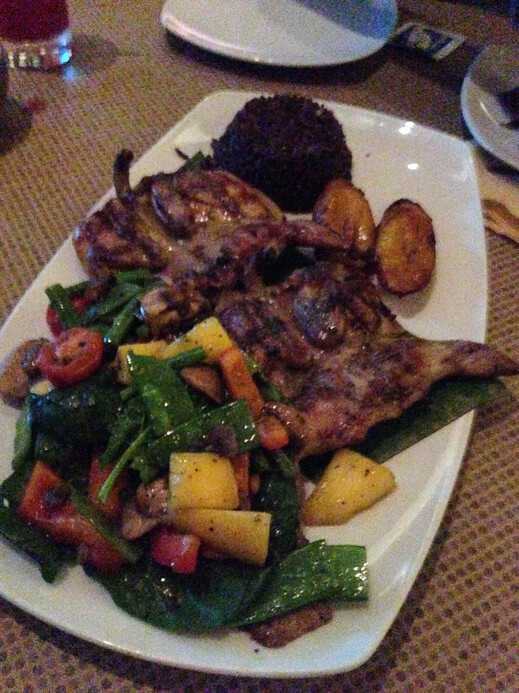 We enjoyed Tamales filled with chicken and potato, Platano Frito, and Grilled Quail accompanied with gallo pinto and vegetables. Zach enjoyed an entrée of Pollo a la Mexicana with refried beans and rice. Margaritas with top quality tequila chosen by Zach were in order as well. 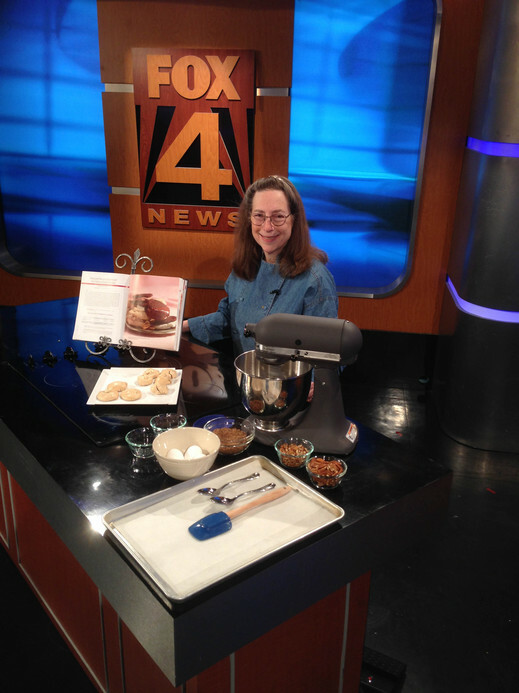 We arrived early the next morning at the Fox 4 television studios for their "Good Day" news and lifestyles show. 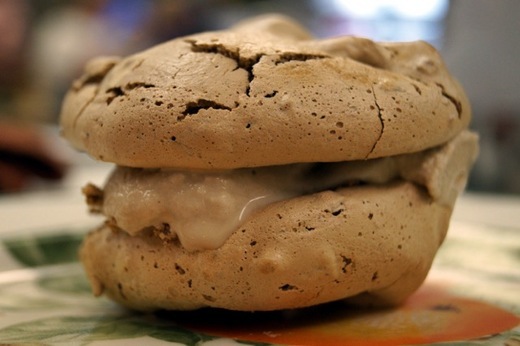 My appearance was to feature our recipe for one of my favorite cookies, The Praline Meringue Ice Cream Sandwich Cookies from The Baking Bible. Woody and I had made 20 of them in advance and packaged them carefully to transport in our carryon. Anchor hosts Tim Ryan and, Lauren Przybyl, couldn't have been more delightful and put me at ease with lively questions as I demonstrated cracking eggs with my newest favorite kitchen tool, the Crack'em, and made the cookie batter. My dearest friend, Judie Bird, drove all the way from Ft. Worth to met us at the studio. She is a regular on the show and had invited me to teach at her former cooking school, which was one of the best teaching experiences in my career and forged out friendship. Seeing her again was one of the icing on the cake experiences of this visit to Dallas. Zach drove us over to meet Chandler Roosevelt Lindsley for us to see the layout of her home in anticipation of our demonstration and book signing event the following afternoon. Chandler is the granddaughter daughter of Eleanor and Franklin Roosevelt. 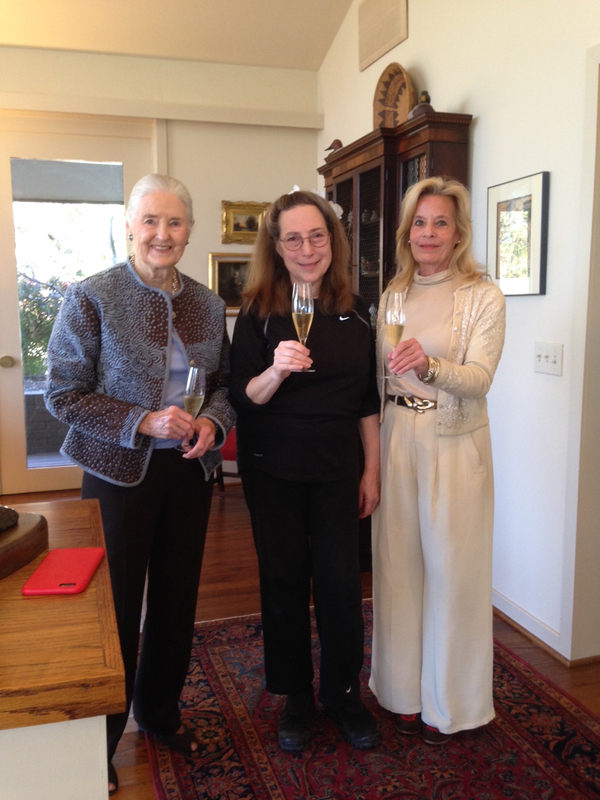 I was especially thrilled to meet her because I am a great admirer of Eleanor Roosevelt and have several memories that I wanted to share with Chandler including having worked as a medical secretary in the house which Eleanor had gifted to her physician Dr. Gurevitz (whom I had met in the 60's). Chandler gave me two of her booklets, which she had written--one called "Quotable Eleanor" and the other filled with Chandler's cookie recipes called "Cookies for Eleanor." I have to say in all honesty that Chandler is one of the truly loveliest people I've ever met. 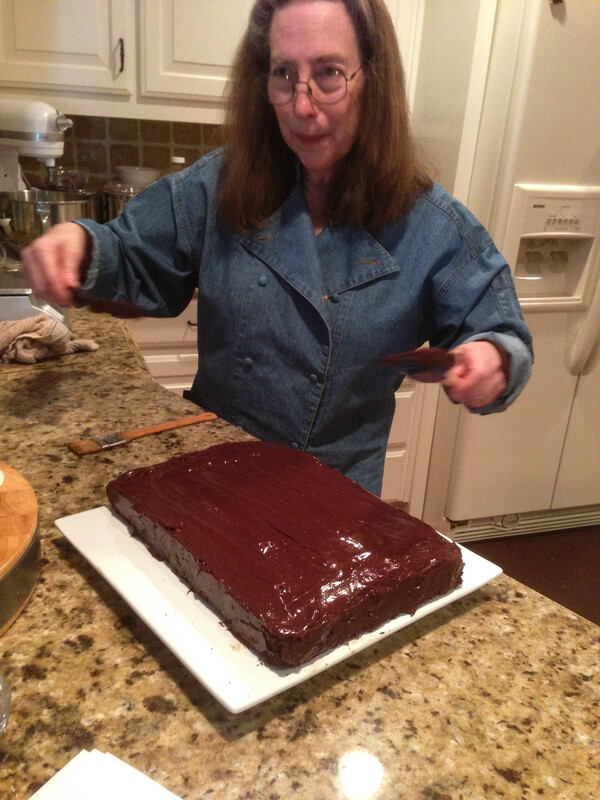 Woody and I returned to Zach's home where we spent the afternoon making our Deep Passion Chocolate Cake with Wicked Good Ganache from The Baking Bible to serve for the Chandler event. Smoke was our dinner destination for Texas style barbeque. Last visit to Dallas we experienced the best pulled pork ever and were determined to return. Chef/owner Tim Byres was recipient of a James Beard award in 2014 for his book, Smoke: New Firewood Cooking. 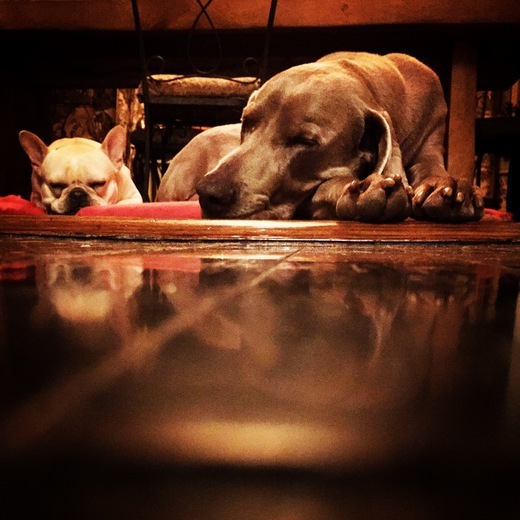 Woody and I shared a Chicken Tamale appetizer and an entrée of the pulled pork enticingly described as Pulled Whole Hog, which we dived into with such immediate enthusiasm that Woody missed taking a picture of it. Zach, who is a regular visitor decided to go for The Big Rib. Chef Tim came out to meet me and sign a copy of his book that Woody gave to Zach as a house present. We completed our meal with Blueberry Cobbler. I always love seeing the majestic and towering Mount Ranier when flying into Seattle. We had given a class at Tom Douglas' Summer Boot Camp four years ago and were invited back to teach a class at his new Hot Stove Society Cooking School located in the elegant Hotel Andra. After we checked into the hotel, we met with the organizers, Janet and Bridgett to go over the mis en place for our class and last minute updates. The evening began with dinner at the Rock Creek restaurant with my family who live in nearby Snohomish: Michael, Frances, and daughter Elyse Beranbaum. We all shared several entrees. Michael had been hearing wonderful things about the restaurant and happily it was located just across the street from the Book Larder where we were schedule afterwards to do a talk and book signing. 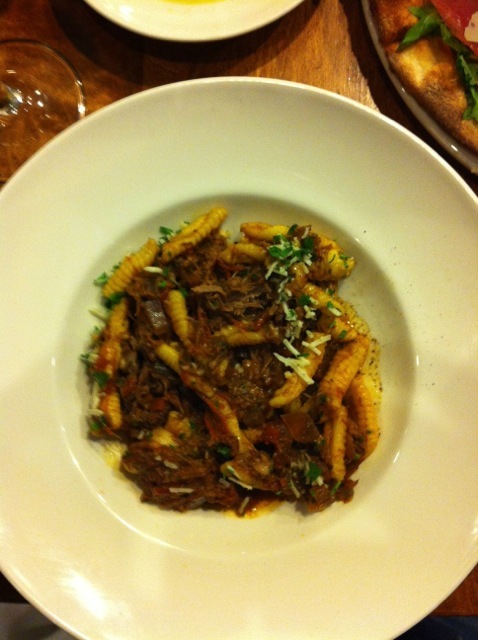 One of Tom Douglas's chefs recommended the calamari which was truly exceptional. 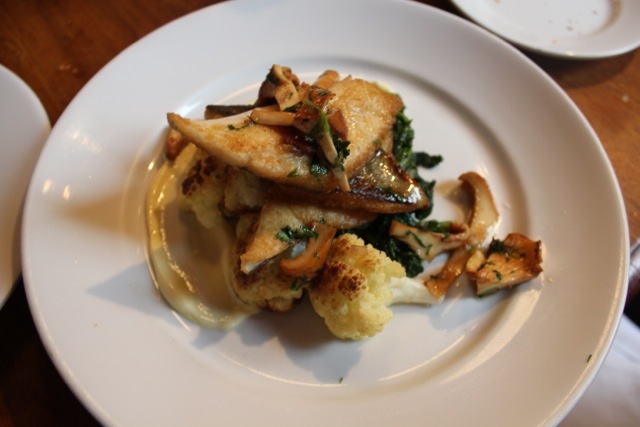 We also loved the veal cheeks and the sea bass. 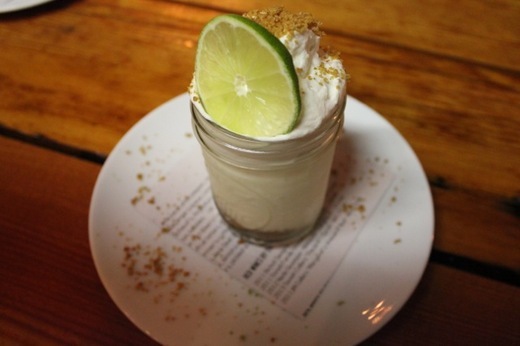 The desserts were a very pleasing rendition of a lime pie and an unusual version of s'mores. Elyse has become something of a baker. She and her high school cooking class were making 200 pies for Thanksgiving to give to charity. 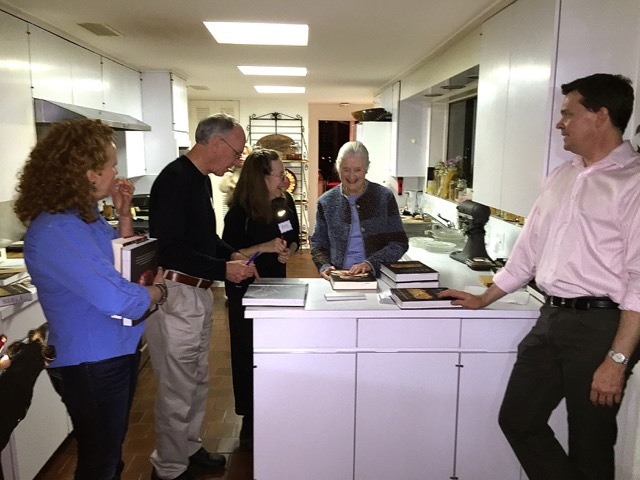 After dinner, we all went over the the Book Larder, which is an impressive new store dedicated to cookbooks. 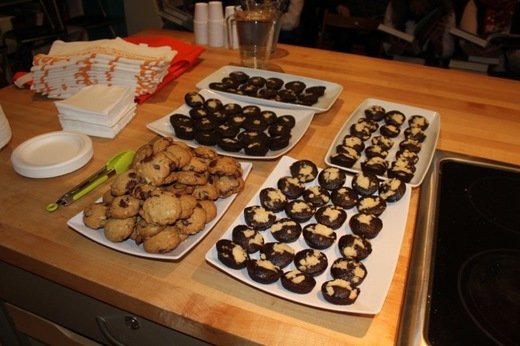 The staff had made the Molasses Cakelets and My Chocolate Chip Cookies from the new book. 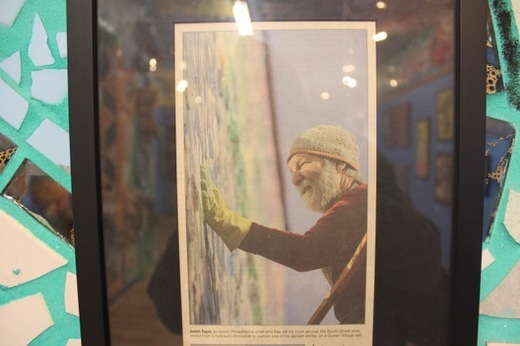 The Book Larder has a tradition of having guest lecturers sign a poster of their book covers. 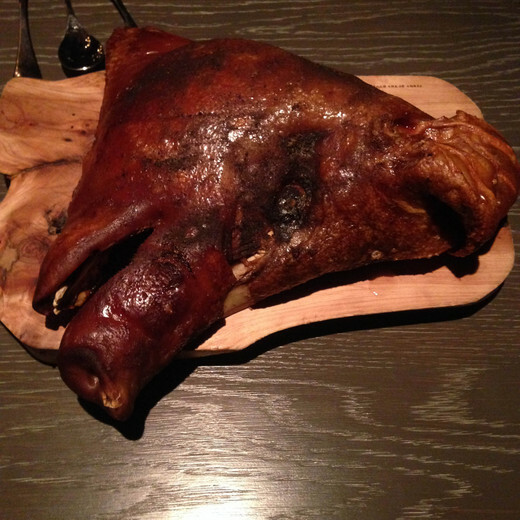 The following day, we discovered what an expanded presence Tom Douglas has in the Seattle area. We walked over to Via6 to begin our day with an interview on his Radio Show conducted by his producer Katie Okumara. 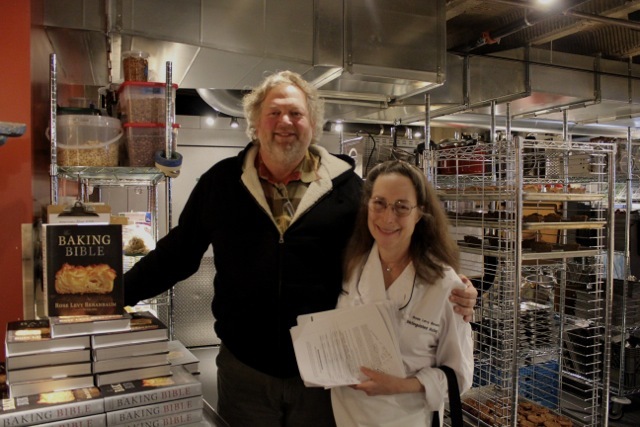 She informed us that Tom Douglas has 17 restaurants in the area, which will grow to 20 by the end of next year. He also turned the hotel's second floor, which was mostly a storage area, into the Hot Stove Society's school, kitchen, and bar facility. Tom met me with a hug, a warm, welcoming introduction to the class attendees, and an apology for not being able to stay for the class due to a last minute meeting. Our class was from two recipes in the book, the Cadillac Café Milk Chocolate Bread Pudding and the Praline Pecan Meringue Cookies. 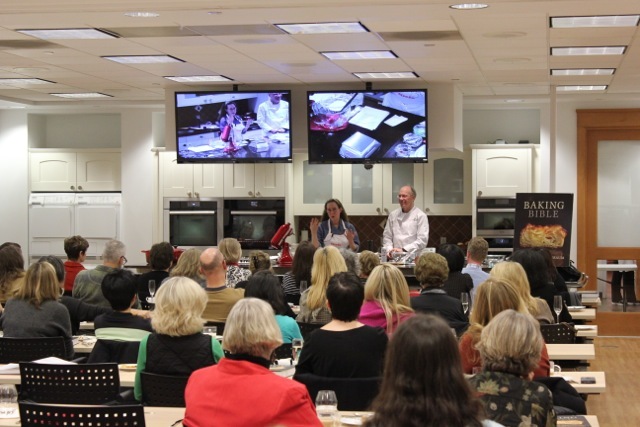 Along with chairs and tables for attendees, several people can sit right at the demonstration kitchen island. We invited the class to ask questions as we demonstrated and were taken up on the offer big time. The first question was from a woman who had just posted that very same question on our blog that morning. It was a special moment actually meeting someone in person whom we had met only electronically! As we lectured and made the bread pudding and cookies, the desserts, which were made by several of the class members the day before, were passed out to the class. A wonderful book signing concluded the class, giving us the opportunity to have conversations with many of the attendees, and getting advice as to where to try out the best Kouign Amann (the pastry that graces The Baking Bible cover) in town. For our evening activity and last day in Seattle, stayed tuned for next week. 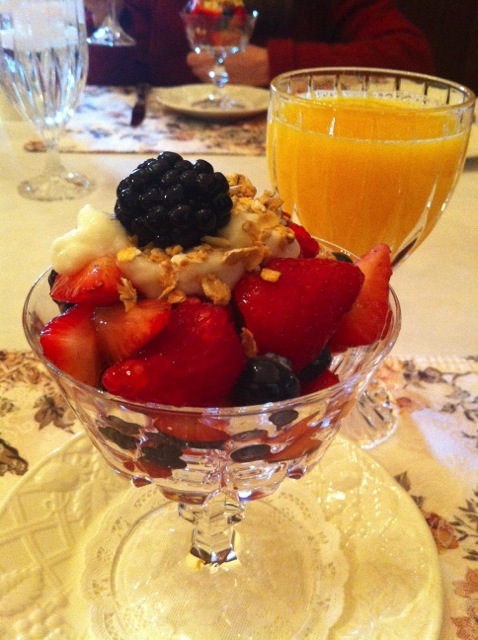 Breakfast at Cedar Gables Bed and Breakfast in Nappa is always a lavish affair--hard to resist even though I'm not normally a breakfast eater. We feasted on the yogurt and fruit parfait and an egg and cheese spicy french toast souffle before leaving for the Bay Area. The morning was devoted to a visit to my cousin Joan in the beautiful high hills of Berkeley, and a return to Inspiration Point. We enjoyed a sunny day's 2 mile walk to the top of the point. 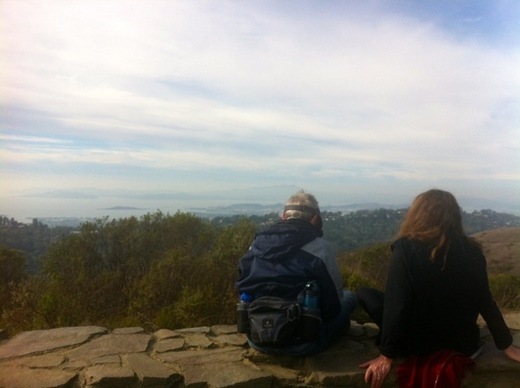 From this high point, you have a panoramic view of the Bay Area all the way to Sonoma valley. 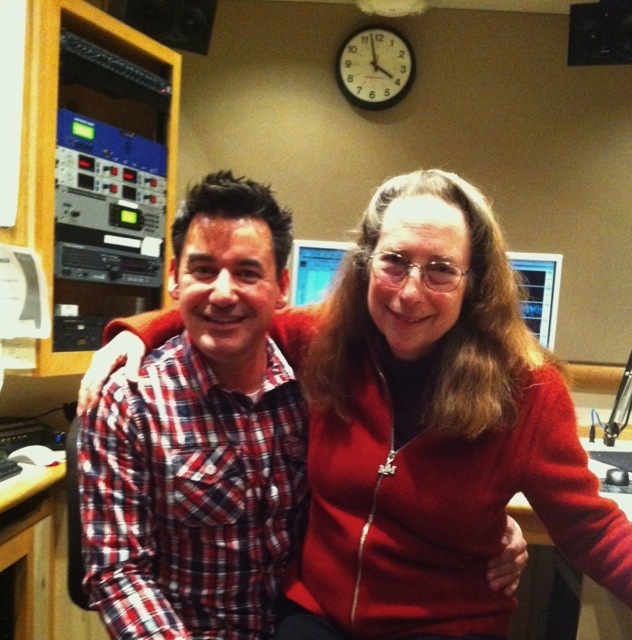 And off we rushed to the next stop--San Francisco, for a radio interview with one of my favorite radio personalities, Joel Riddel, on his Joel Riddel Radio Show. Woody was able to add some of his commentary as well. The final event of our San Francisco tour was an unforgettable evening of discussion with Emily Luchetti, Alice Medrich at the San Francisco JCC. In the Green Room at the JCC, we joined Alice Medric, and our moderator for the evening, Margo True from Sunset Magazine and Books. We were offered an informal diner from the JCC's Cafe. 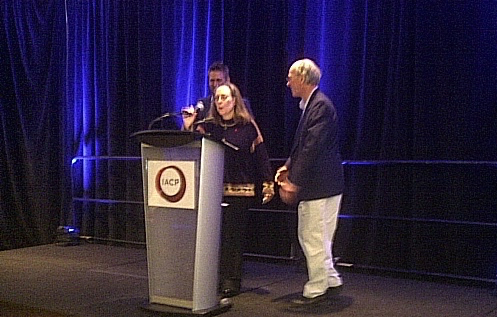 We met with Emily Lucetti on stage, for a sound check, before the evening's program began. Emily's book "Fearless Baker" was published in 2011. 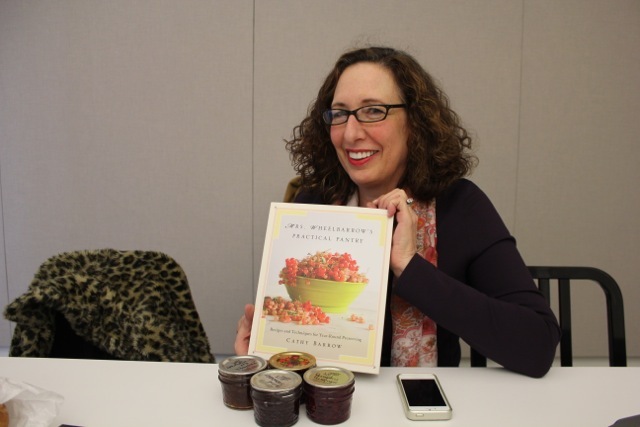 Alice's book, "Flavor Flours", which gives recipes for various non-wheat flours, was published this year. Along with the three of us answering Margo's questions, and discussions and commentary on various topics, we fielded questions from the 300 plus audience. The entire discussion can be viewed on this link. 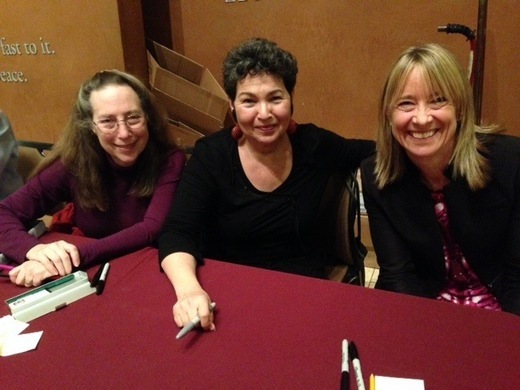 Enjoy A book signing followed with all three of us seated at a table in front of three long lines of lovely and appreciative readers. 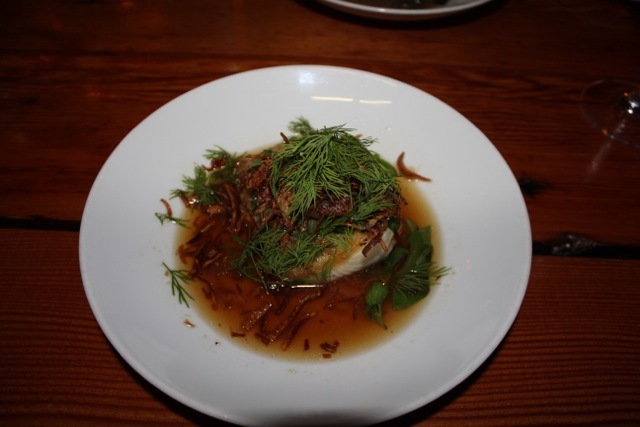 Next posting: Up north to our last city on this leg of the tour, Tom Douglas' Seattle.